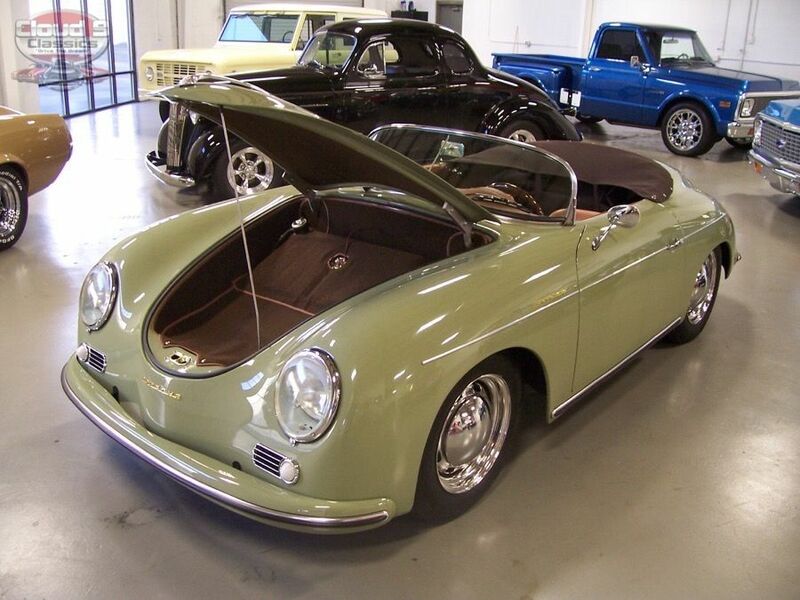 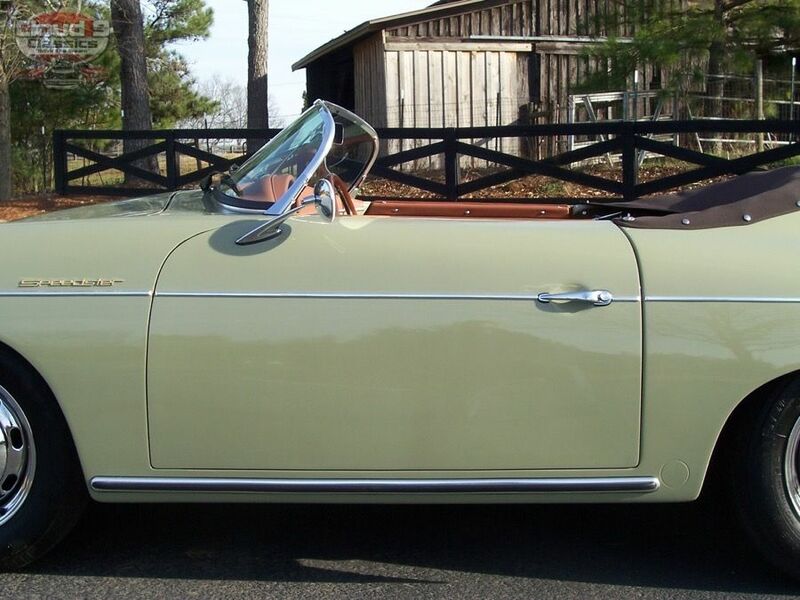 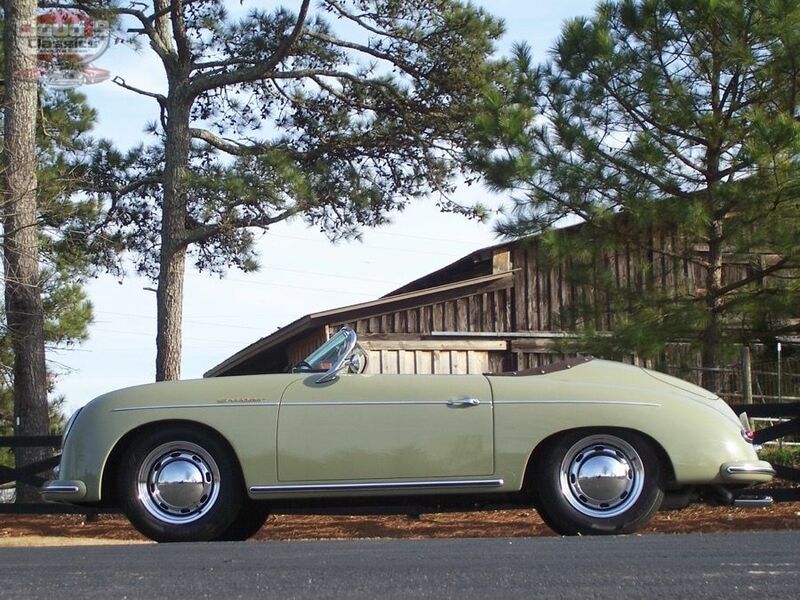 ABSOLUTELY BEAUTIFUL, 1957 PORSCHE 356 SPEEDSTER REPLICA BUILT BY THE BEST, VINTAGE SPEEDSTER….BUILT ONE YEAR AGO WITH JUST 2500 MILES, FRONT DISC BRAKES, FREEWAY FLYER TRANSMISSION…NEAR FLAWLESS CONDITION!!! 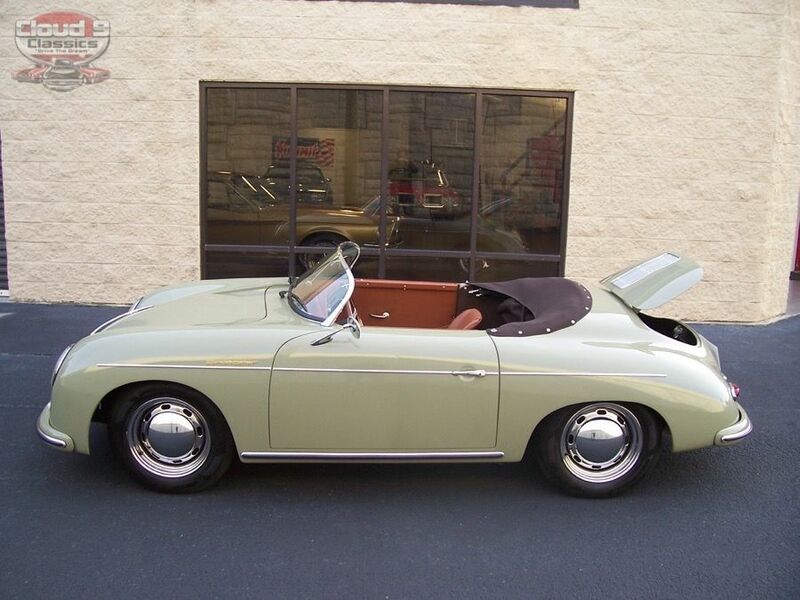 AUTHENTIC ORIGINAL 1957 PORSCHE COLOR….A BLAST TO DRIVE AT A FRACTION OF THE PRICE OF AN ORIGINAL….READY TO SHOW AND GO!!! 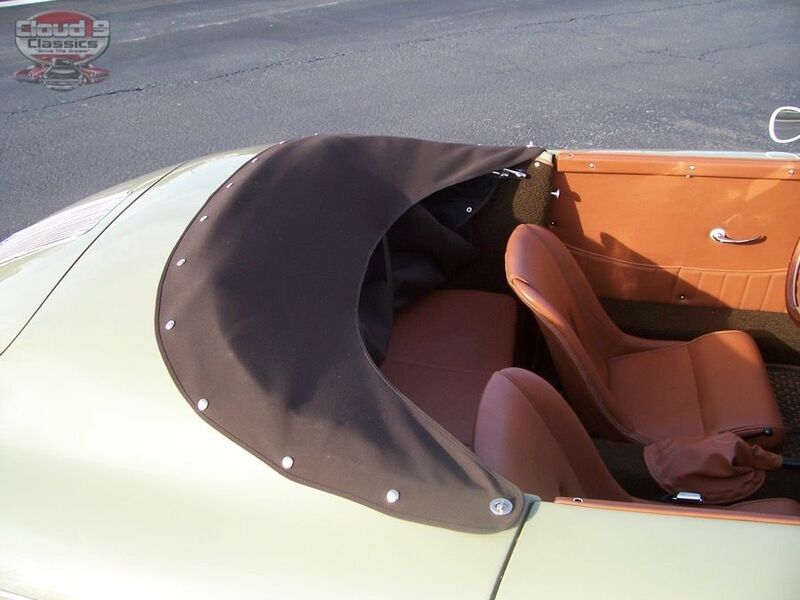 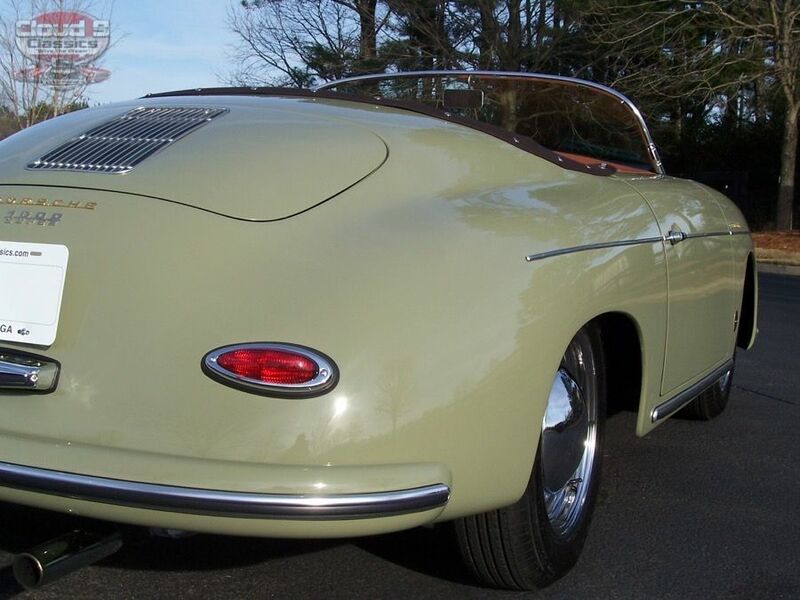 This gorgeous Stone Gray over Saddle 1957 Porsche 356 Speedster replica looks basically brand new as it should with just 2500 miles on the odometer and built just one year ago. 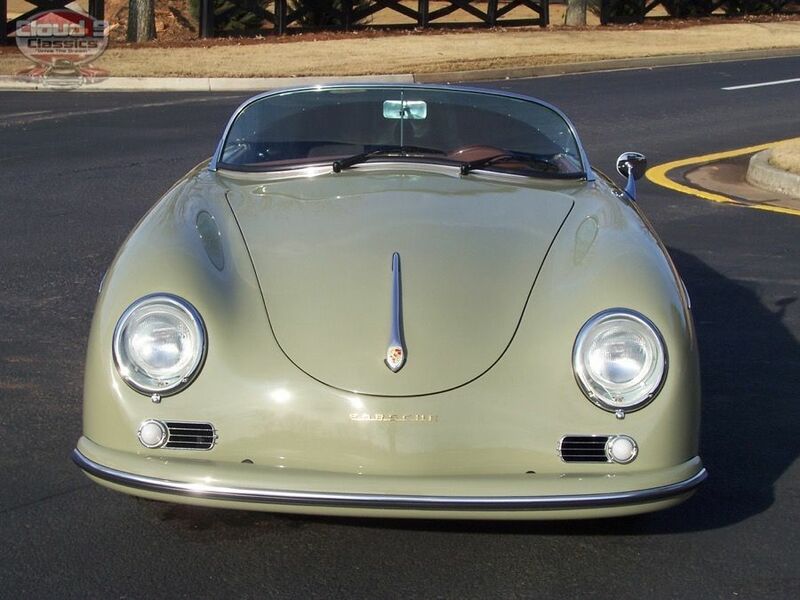 It was purchased by a gentleman from Tennessee directly from Vintage Speedster. 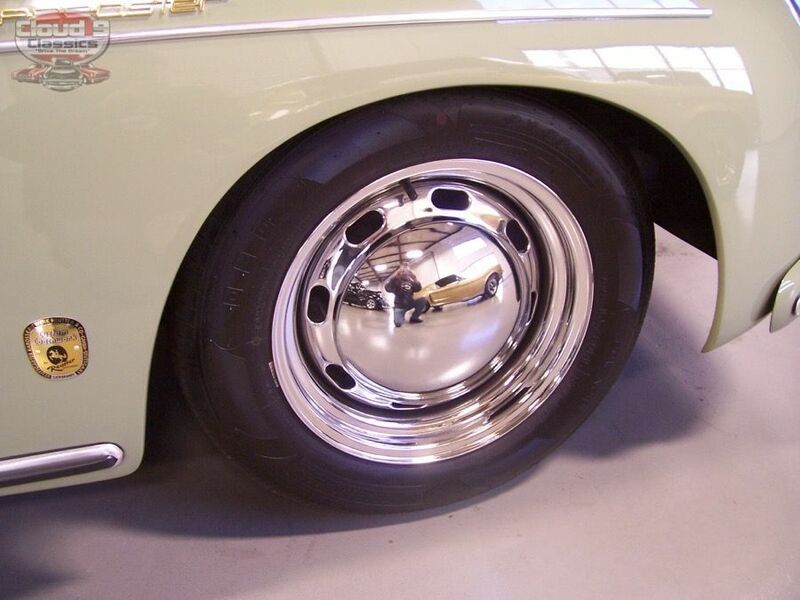 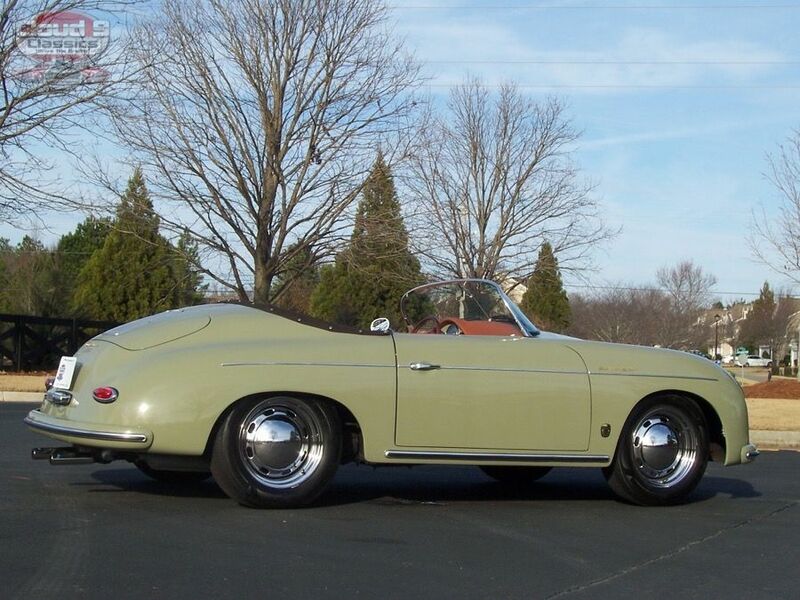 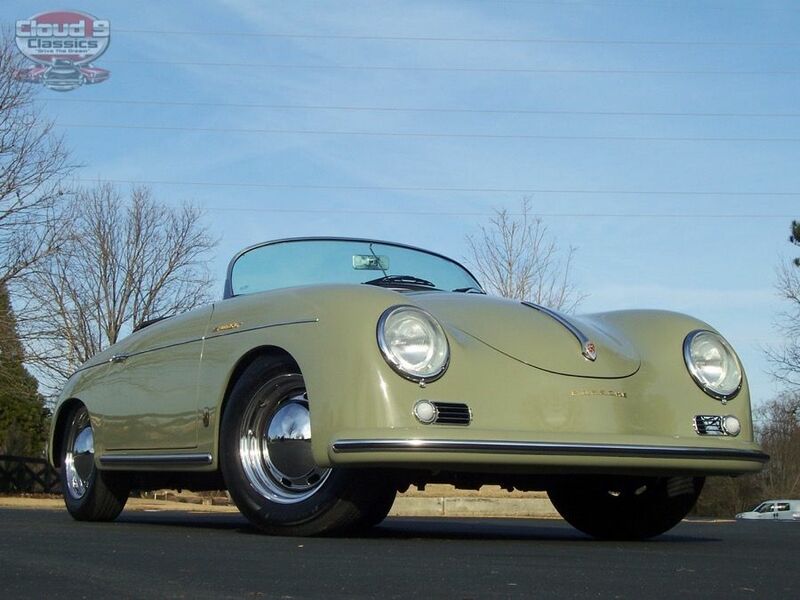 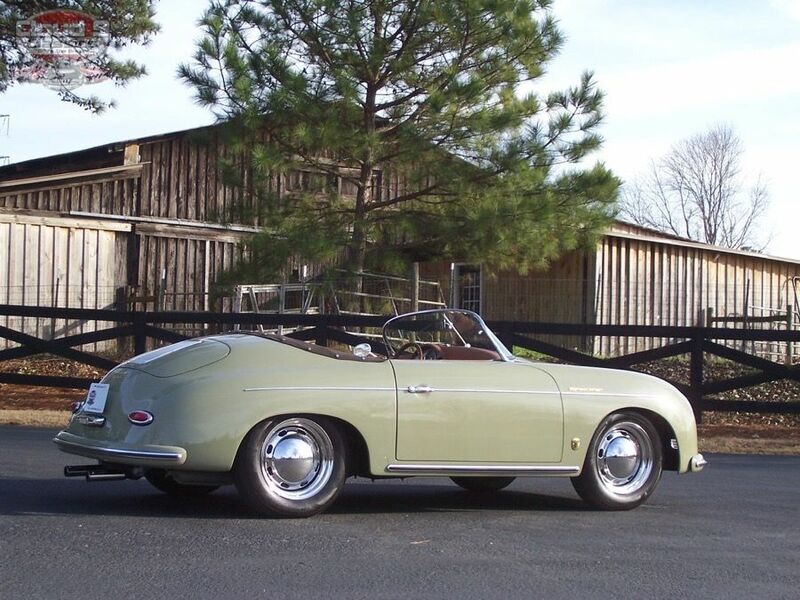 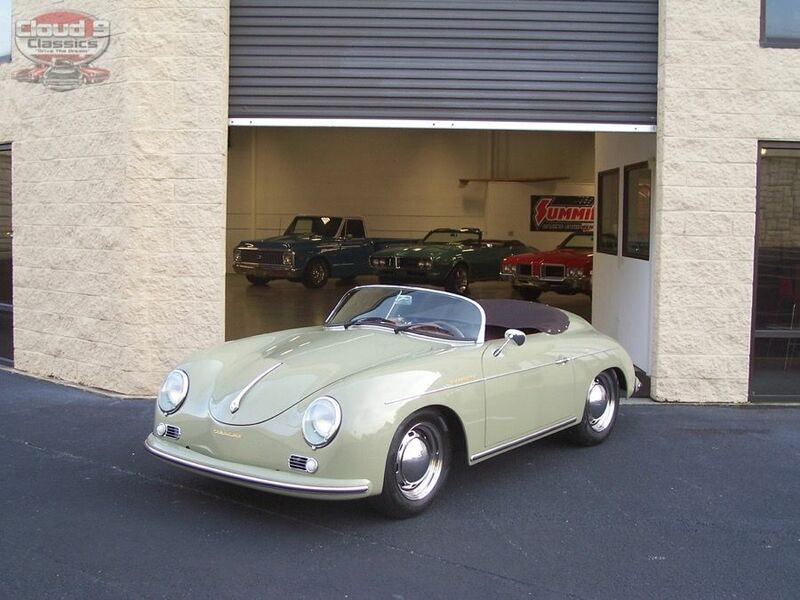 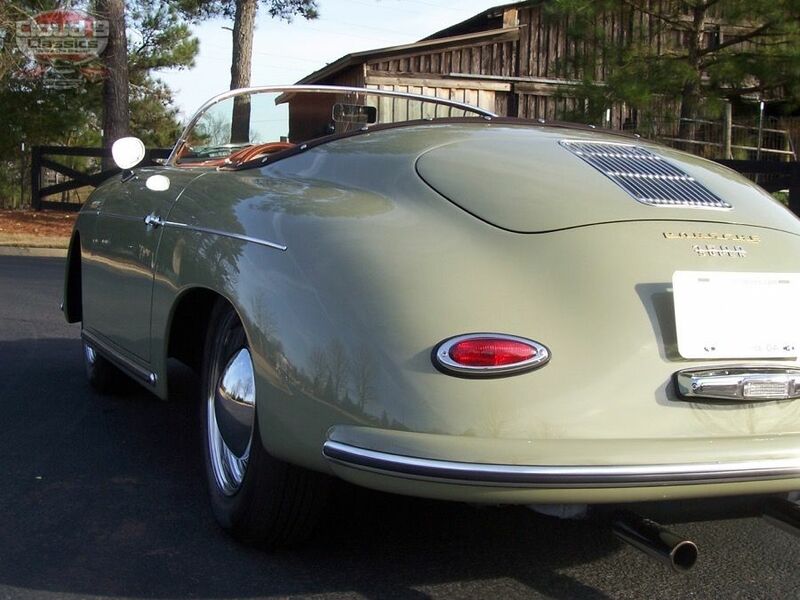 He special ordered this beauty in an original 1957 Porsche Color called Stone Gray and was thrilled with it. 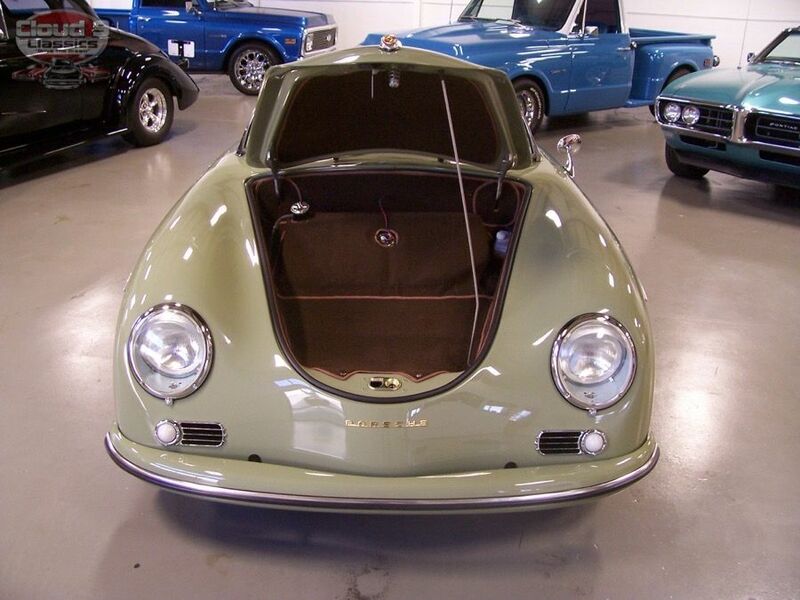 He is in the process of building a new home and unfortunately this requires him thinning his collection of toys so his wife can buy all new furniture….sad for him, lucky for the next owner…maybe you!!!!? 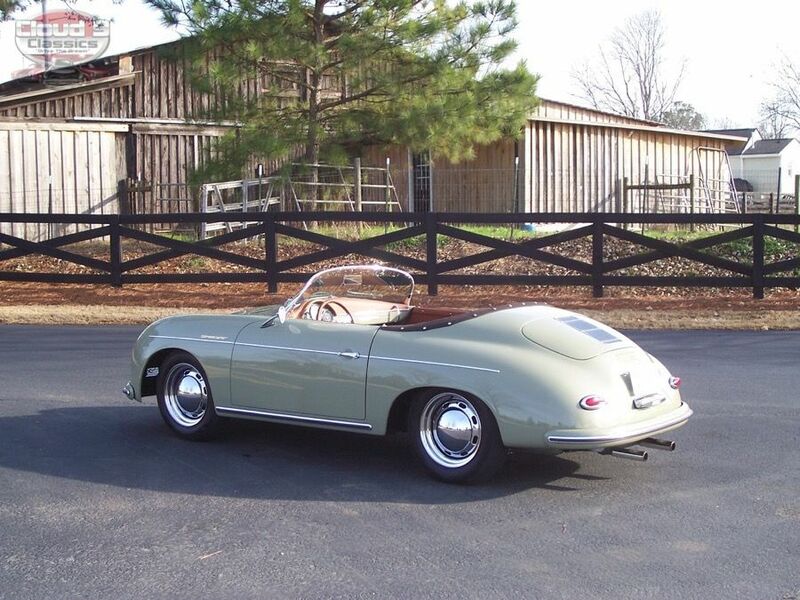 I recently purchased this Speedster from him and had it transported in an enclosed trailer to my showroom in the Atlanta, Georgia area. 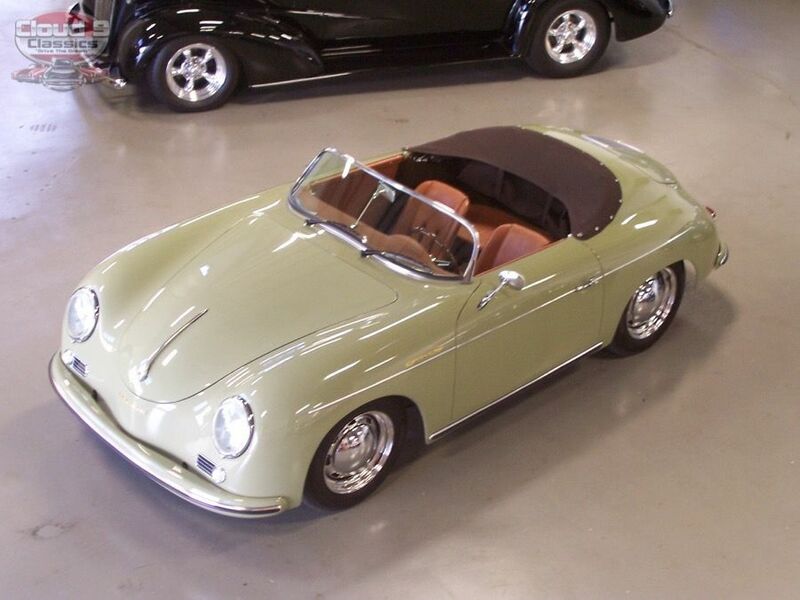 I have owned over a dozen of these awesome little cars and the quality of the Vintage Speedster built cars is really top notch and most people cannot discern this car from an original. 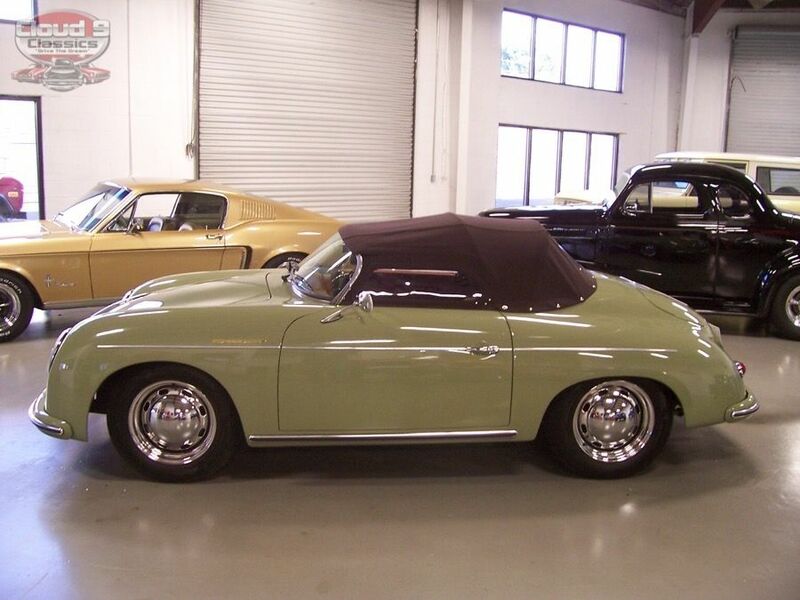 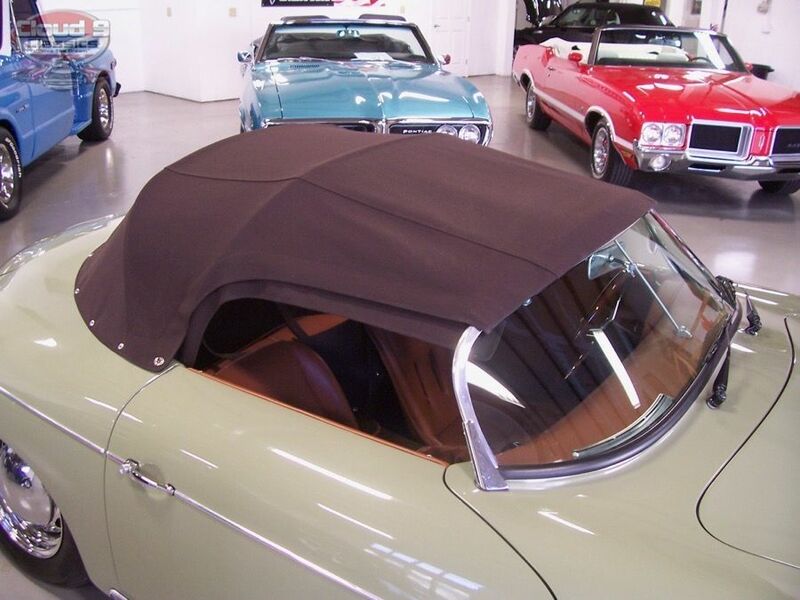 This Speedster was pampered and kept covered in a garage when not in use. 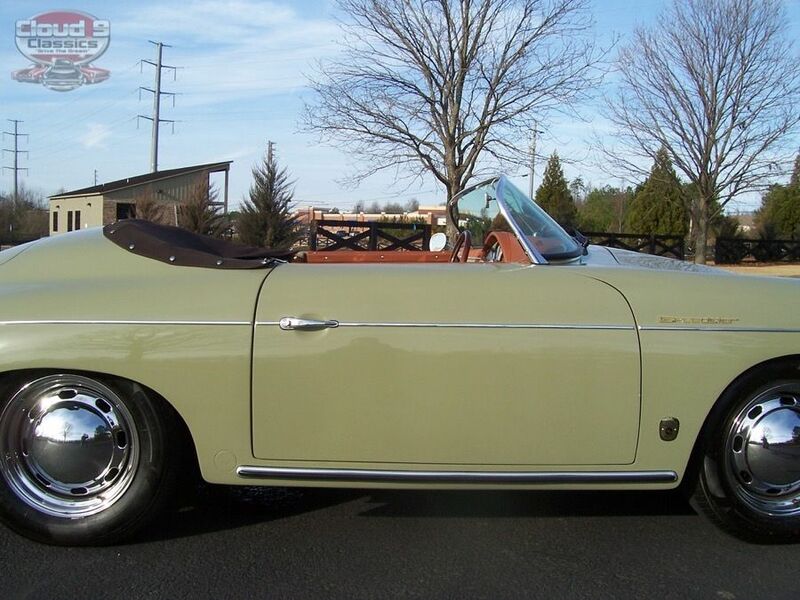 You will not be disappointed with the condition or peformance of this beauty!!!! 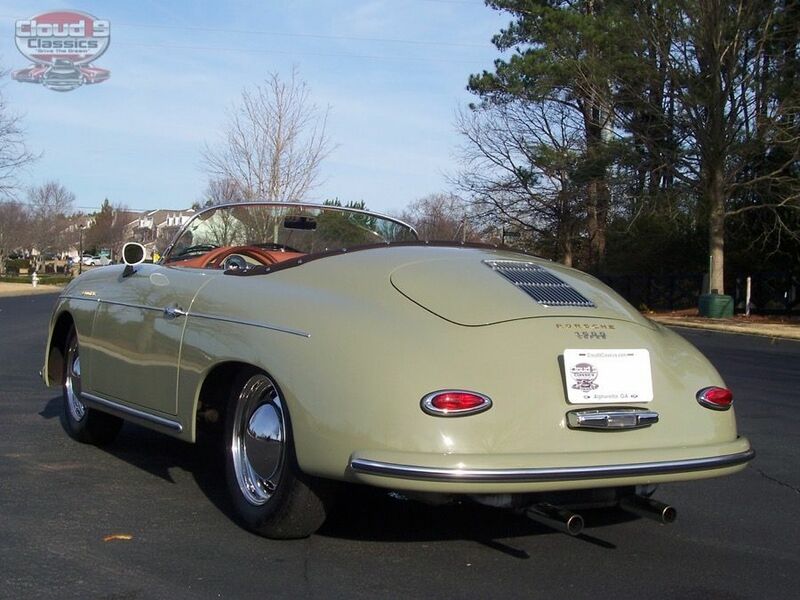 I will do my best to provide enough large images, a video so you can hear it running, and an honest description to help you decide if this is the one to help you celebrate the New Year with. 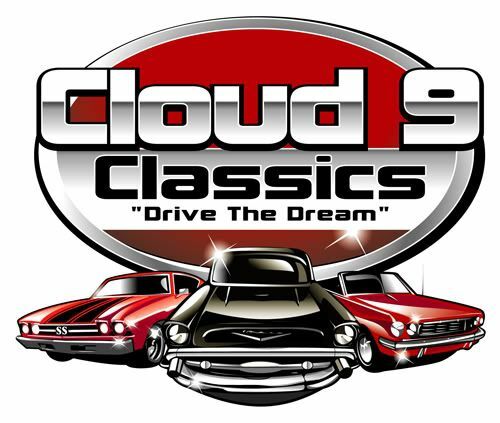 As with all of my classic I do have it listed on my website and several others so if you decide you want to scoop it up before the next car guy or gal does feel free to cal me to discuss how we can make that happen. 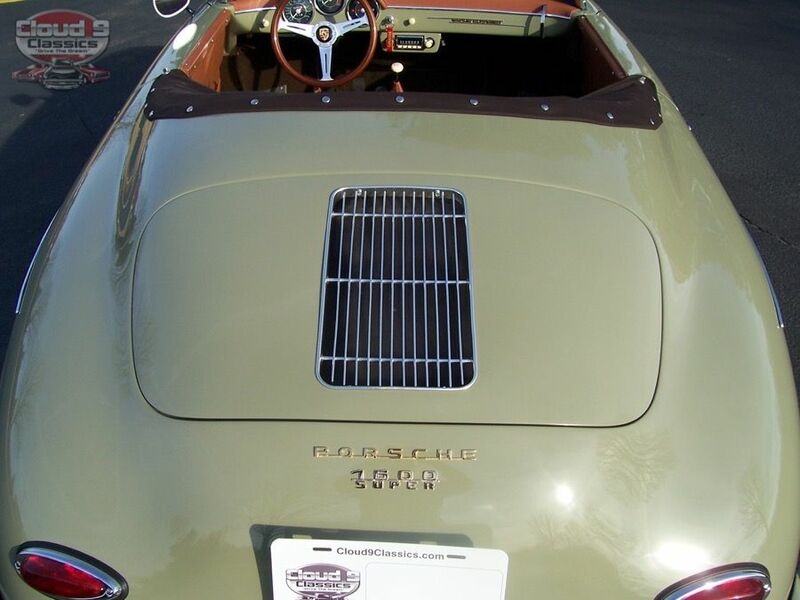 I welcome overseas buyers and I am also a licensed transport broker and can get the buyer a great rate on Enclosed Transport anywhere in the US or to the port of your choice. 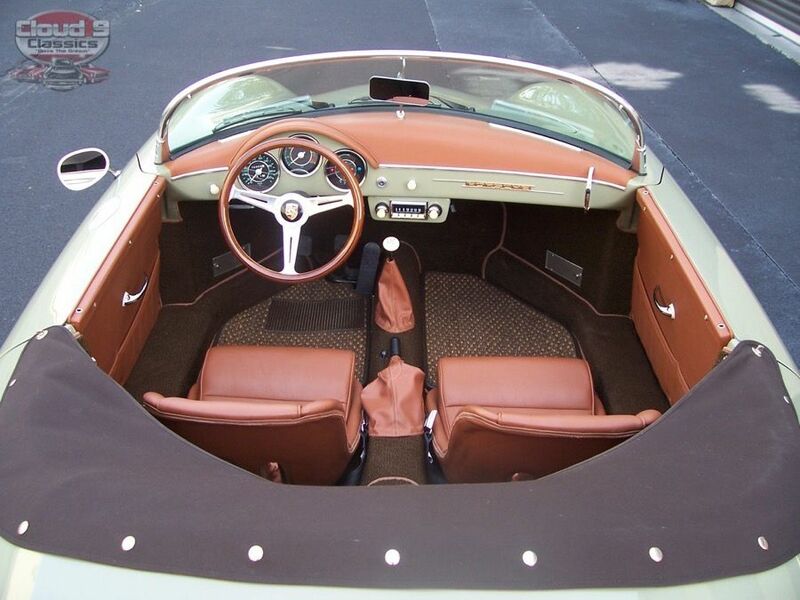 Sit back and enjoy! 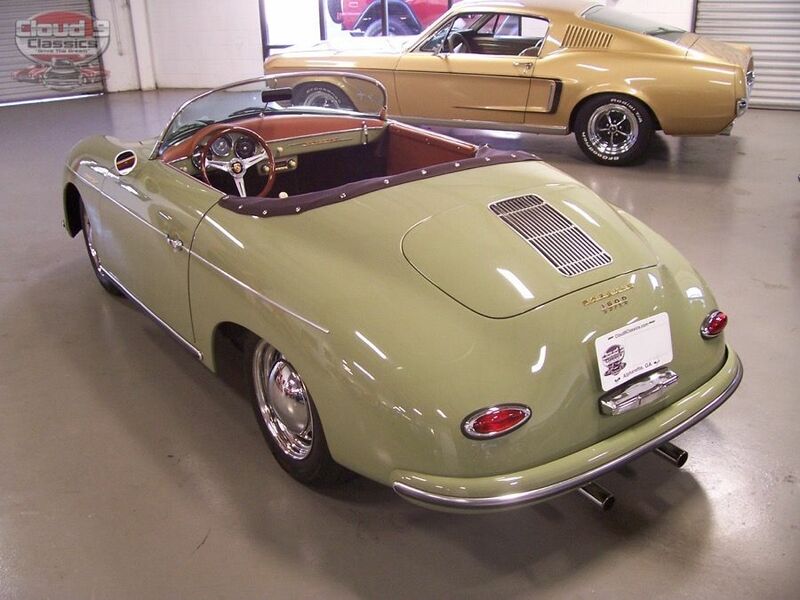 This car was hand built by Vintage Speedster out of California and is not a kit car. 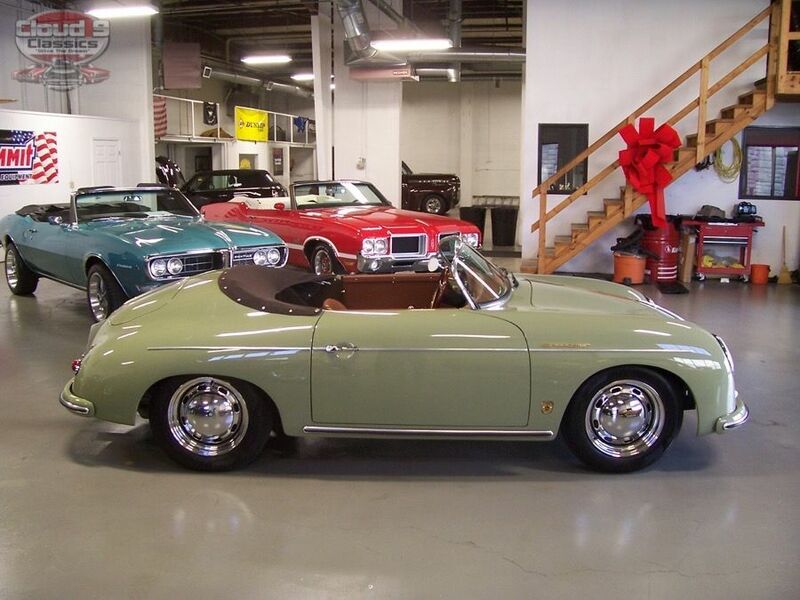 Vintage Speedster is the #1 builder of these cars producing more of them than any other builder and their quality and fit and finish is top notch. 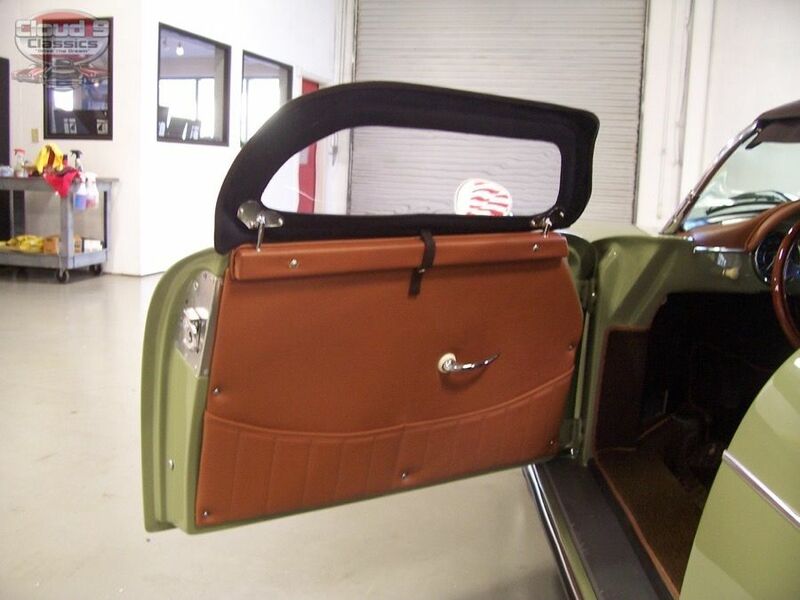 They use a custom built, jig welded 2″x4″ 11 gauge steel frame. 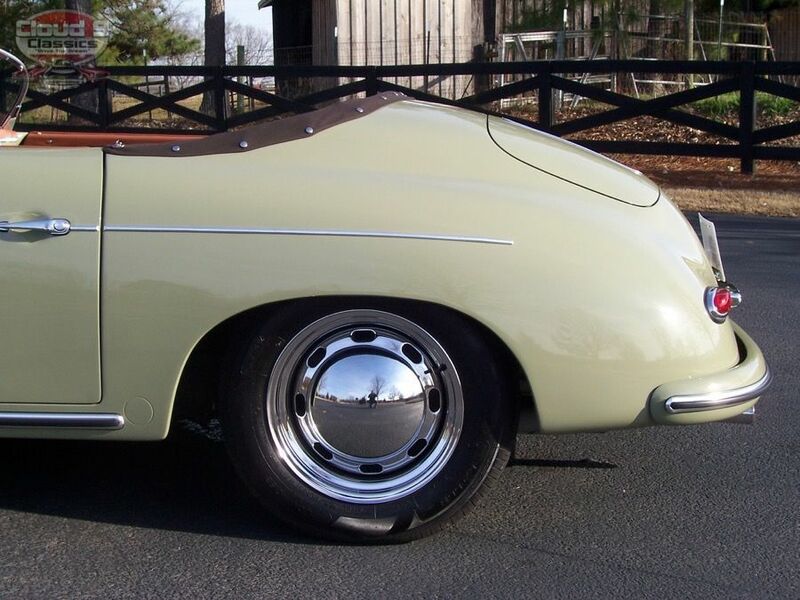 This rigid structure retains the original VW floorpan designed by Dr. Ferdinand Porsche and integrates the largest frame possible. 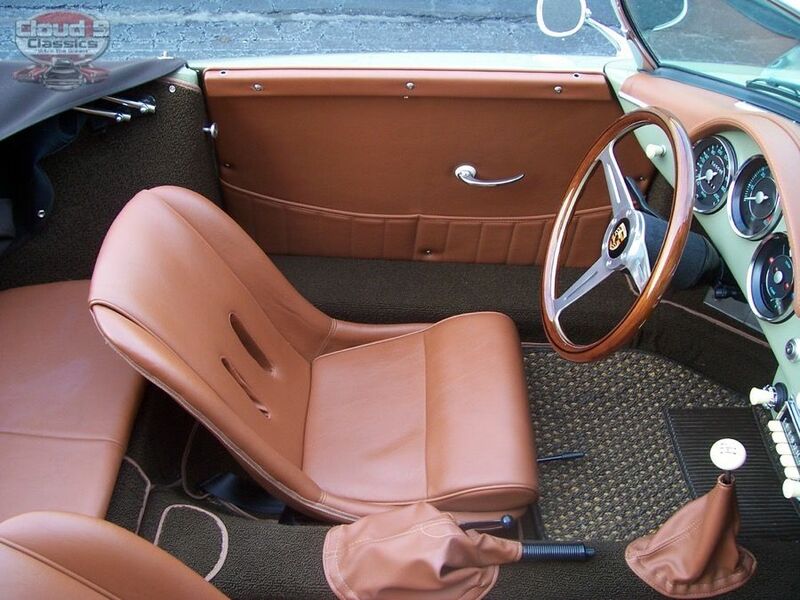 In addition the steering is slightly offset just like in the originals. 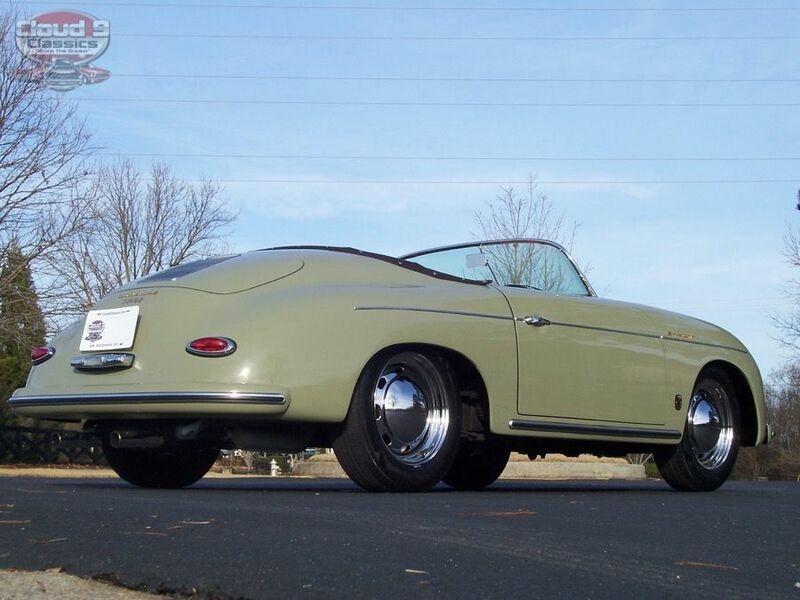 While the original 356 Speedsters are very rare to find, these Vintage Speedster built replicas are also rare with only a little over 3000 built. 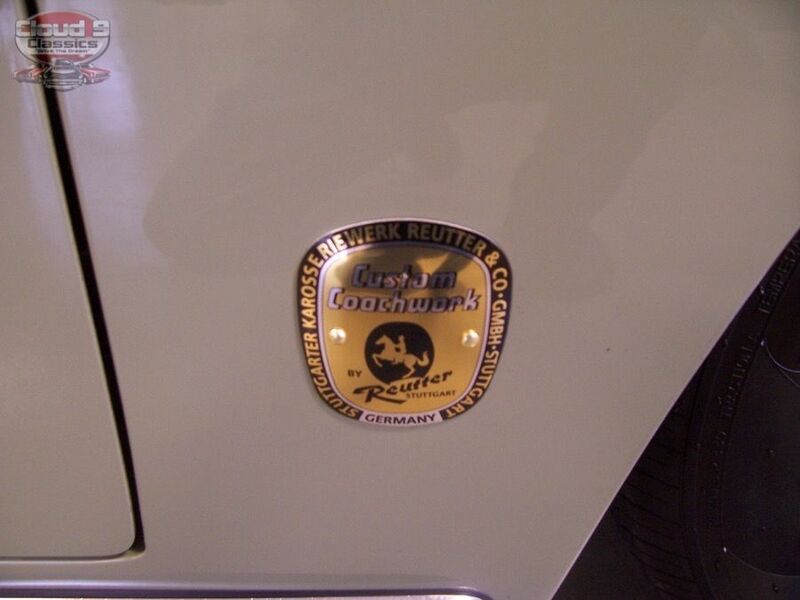 I have owned over a dozen of these and with the prices of the real ones going through the roof can definitely say that these are a tremendous value that offer all of the fun factor of the real deal at a fraction of the price. 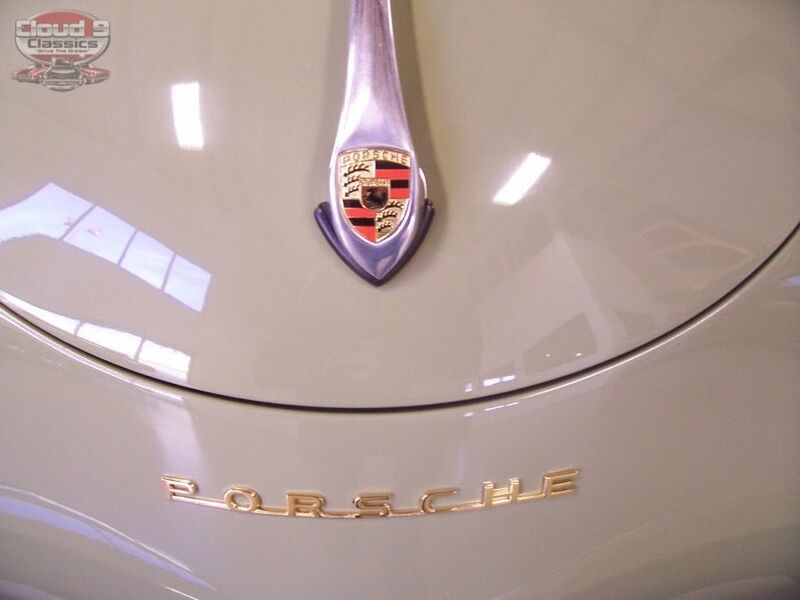 Even avid Porsche enthusiasts have a difficult time telling these from the real ones. 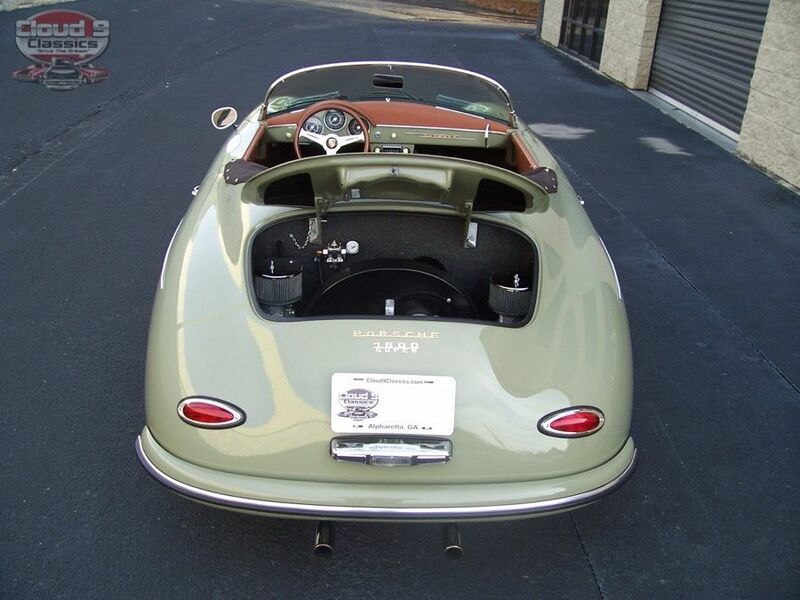 Body and paint are truly near flawless. 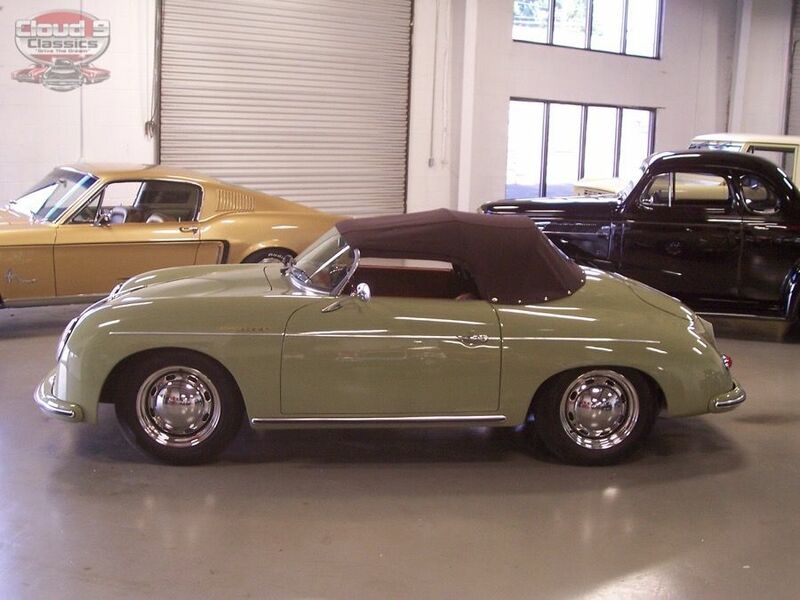 I found 3 really tiny rock chips but otherwise this 356 Speedster is really in showroom conditiion. 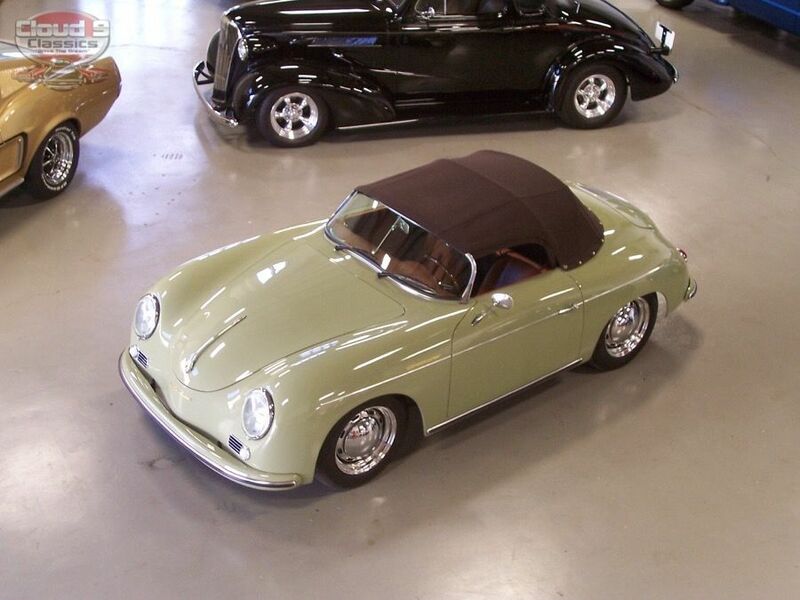 The color is perhaps the nicest I have owned on one of these 356 Replicas. 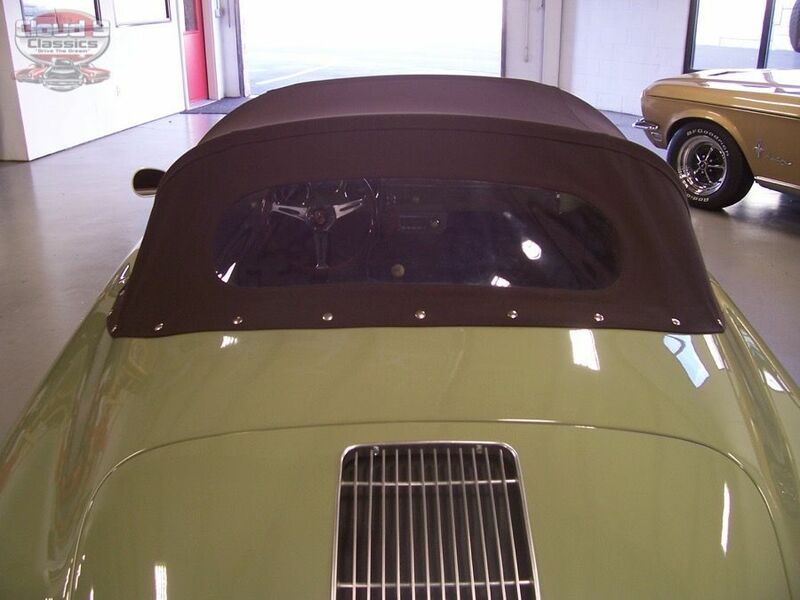 It is called Stone Gray but as you can see in the pics has more green than gray in it. 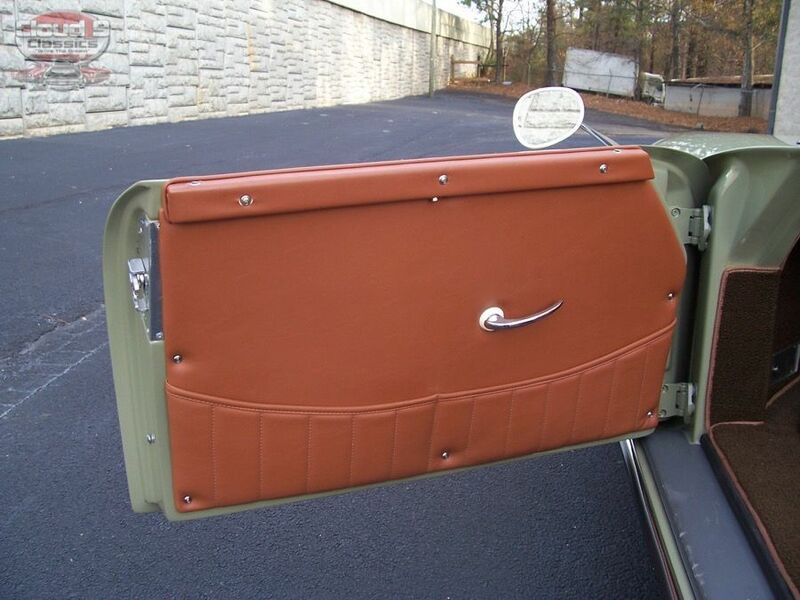 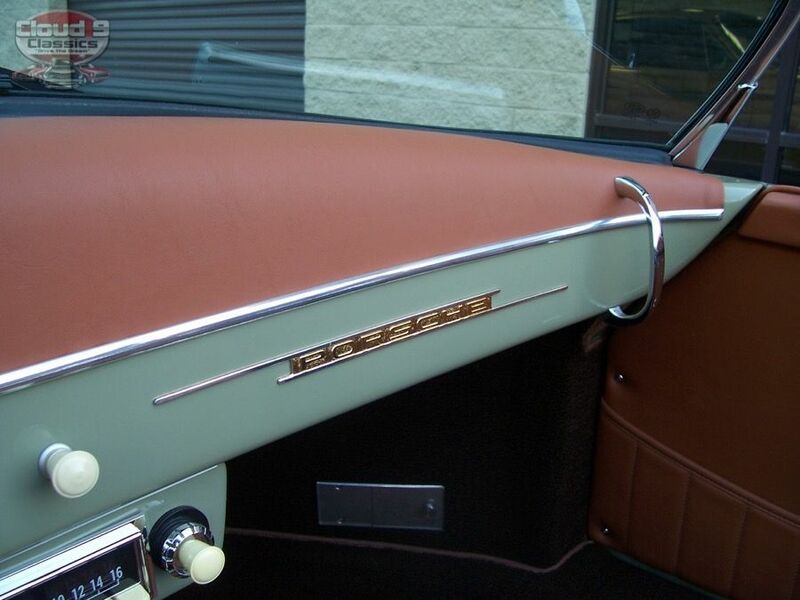 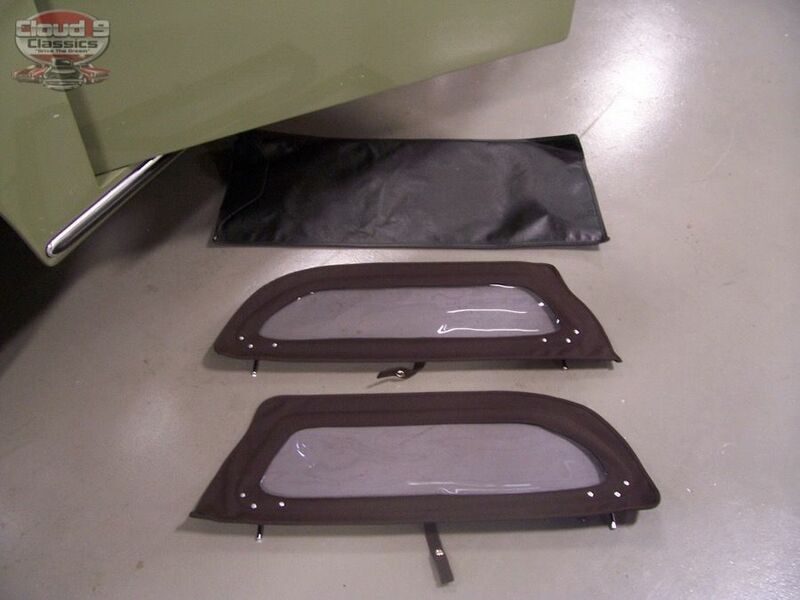 This is one of the facotry original colors used in 1957 which really adds to the look and authenticity. 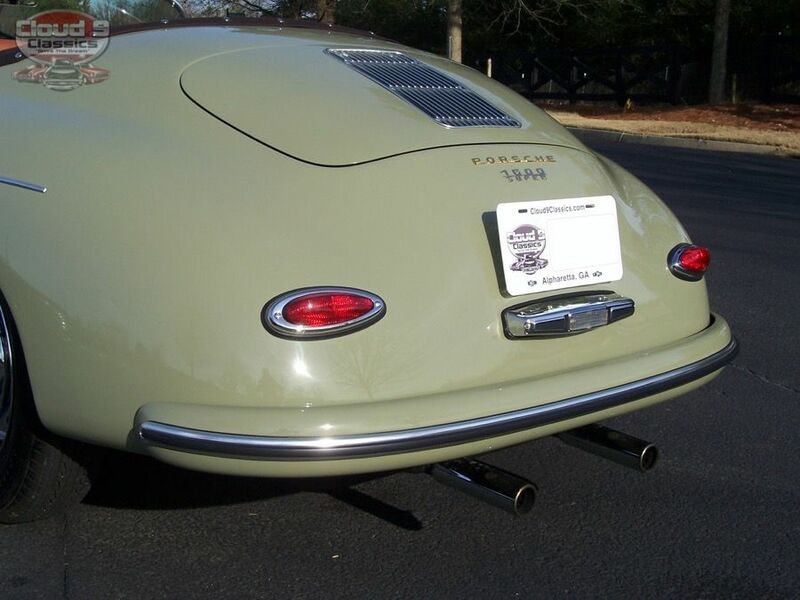 All of the chrome, badging, trim etc. 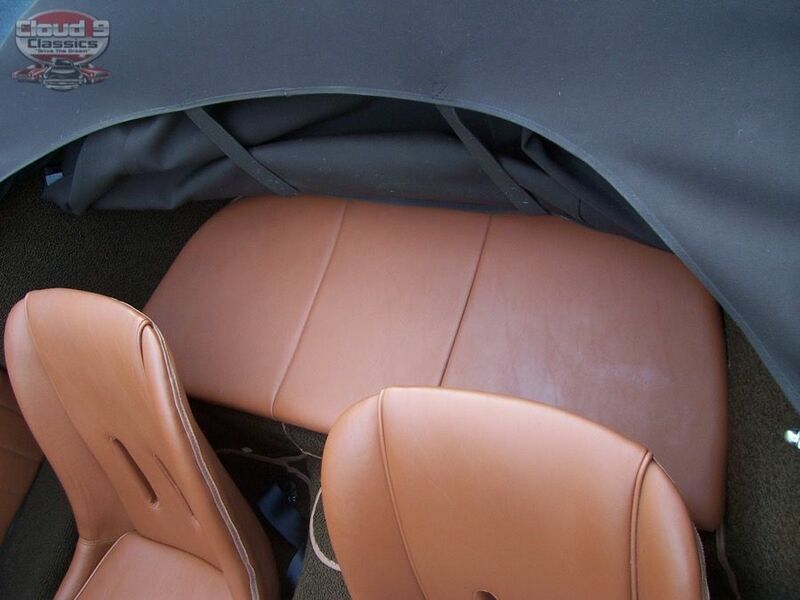 look like new. 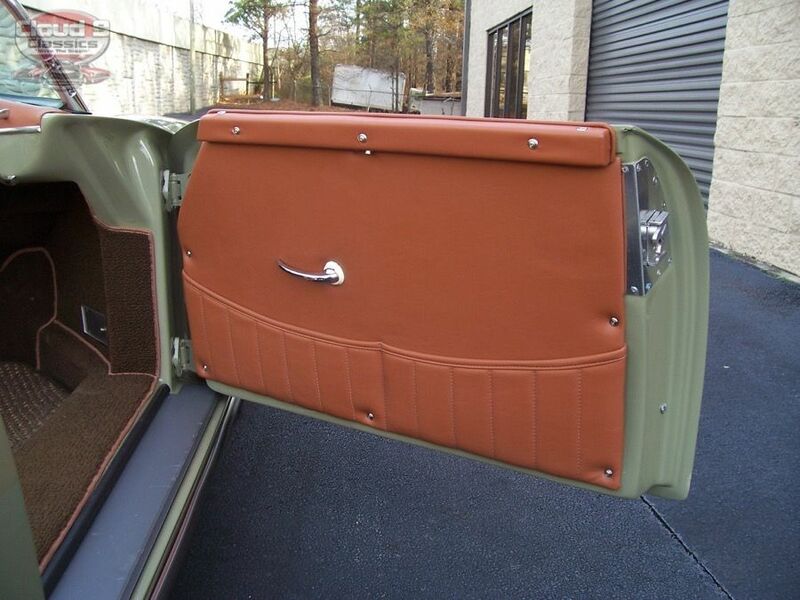 You will be very impressed by the fit and finish of this one!! 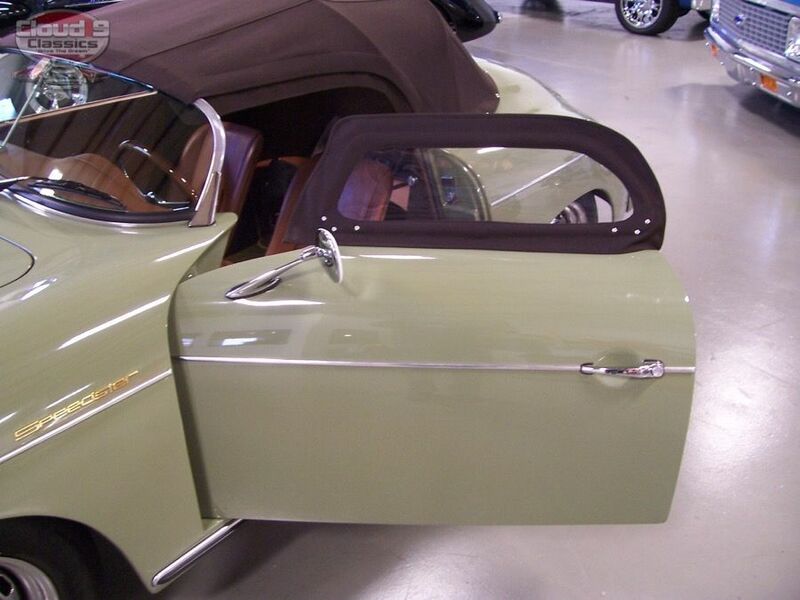 Doors open and shut with a solid feel and body panel gaps are outstanding. 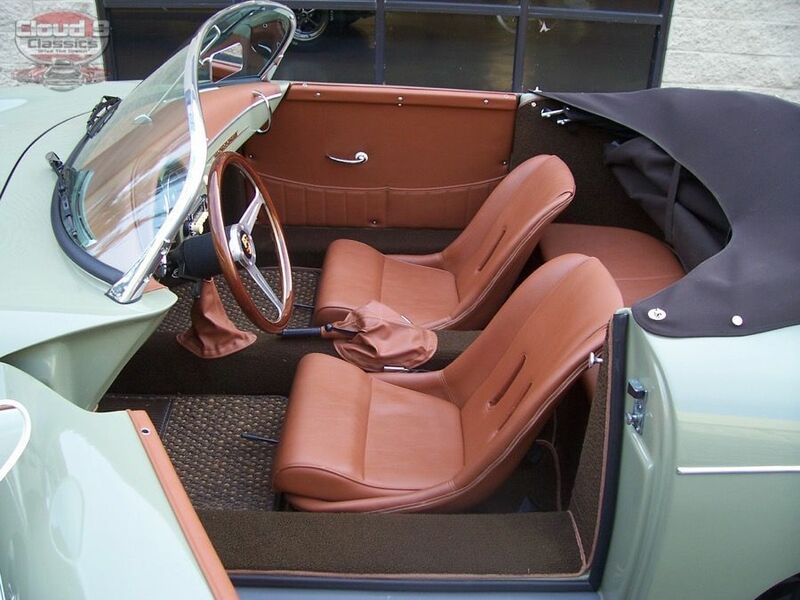 Interior is a beautiful saddle color similar to a baseball glove color that really accents the Stone Gray exterior beautifully. 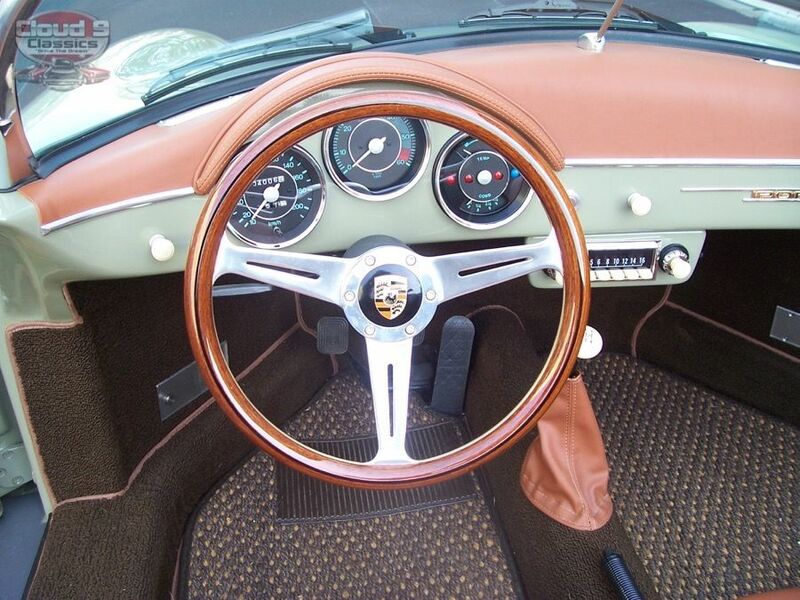 The wood grain steering wheel has a rich look with Porsche emblem center cap. 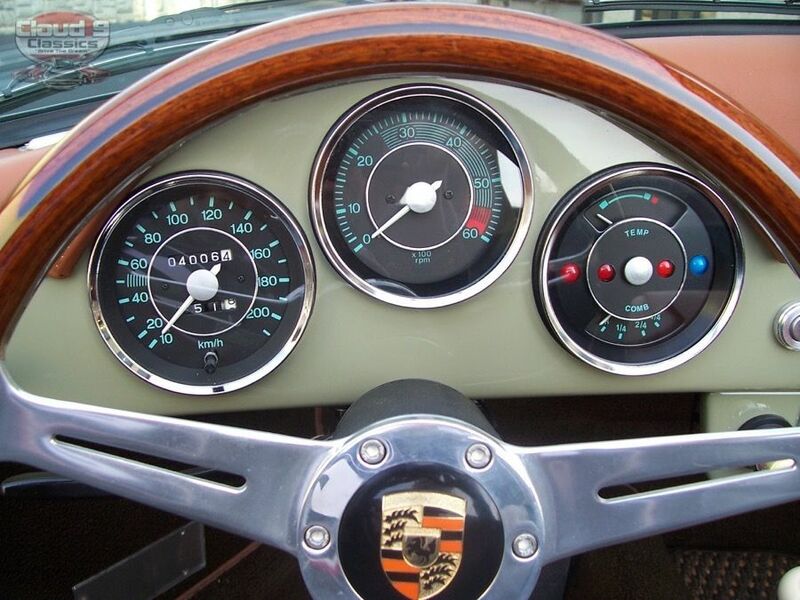 Simplistic gauges in the dash all work correctly. 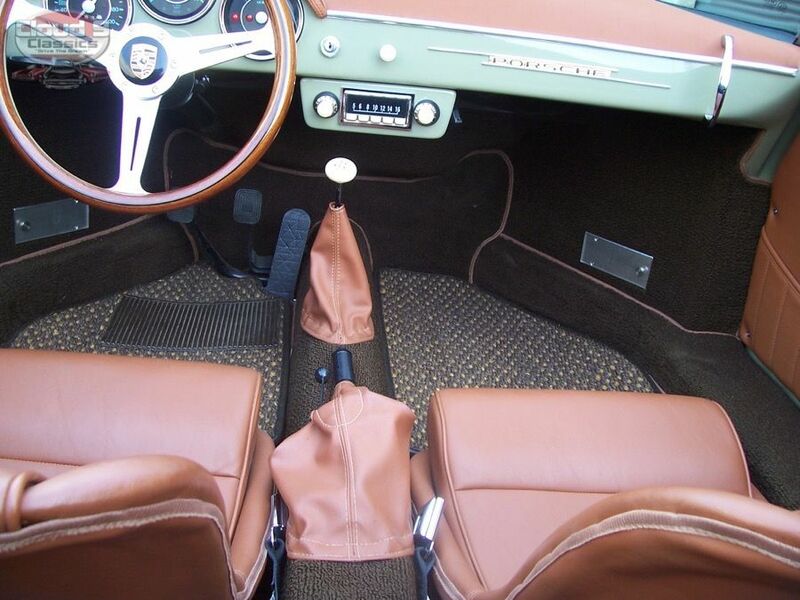 Speedometer and odometer are in Kilometers with just 4010 km which is about 2500 miles. 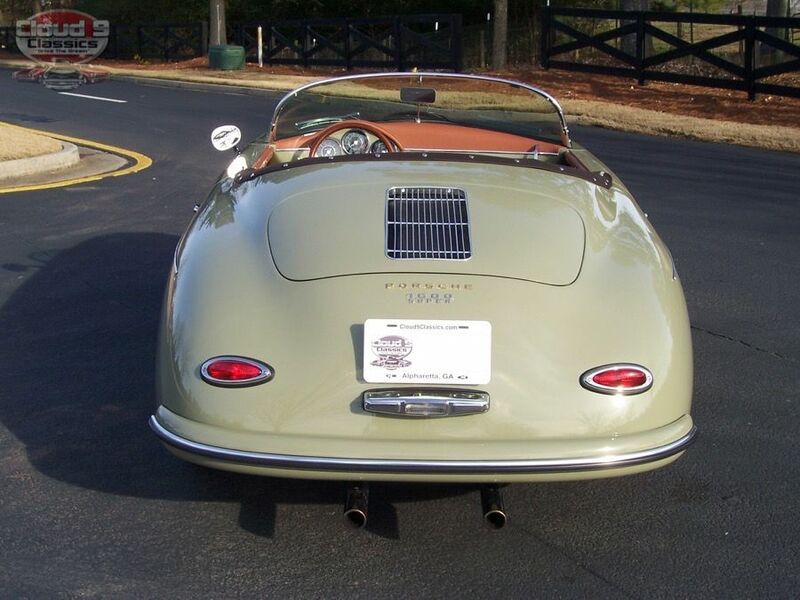 Lights and turn signals all function correctly. 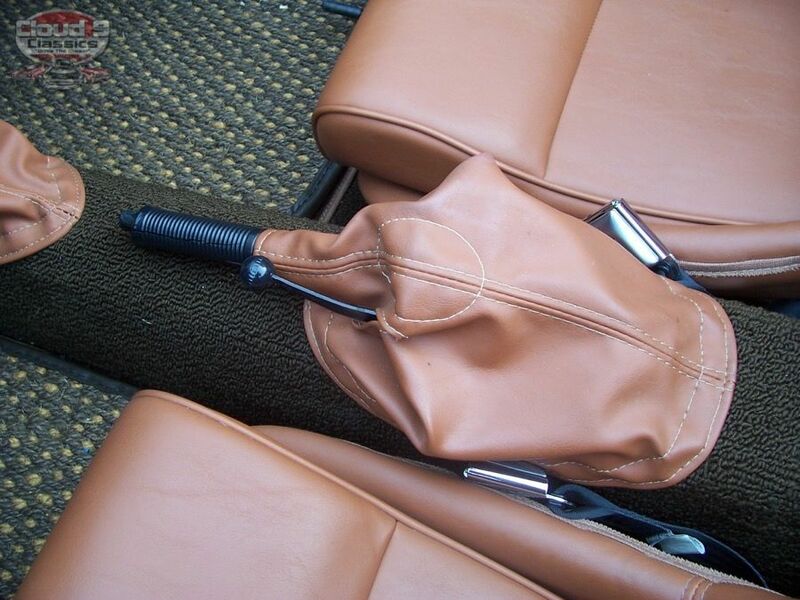 Matching saddle shifter boot, e-brake cover and dash all in near flawless condition. 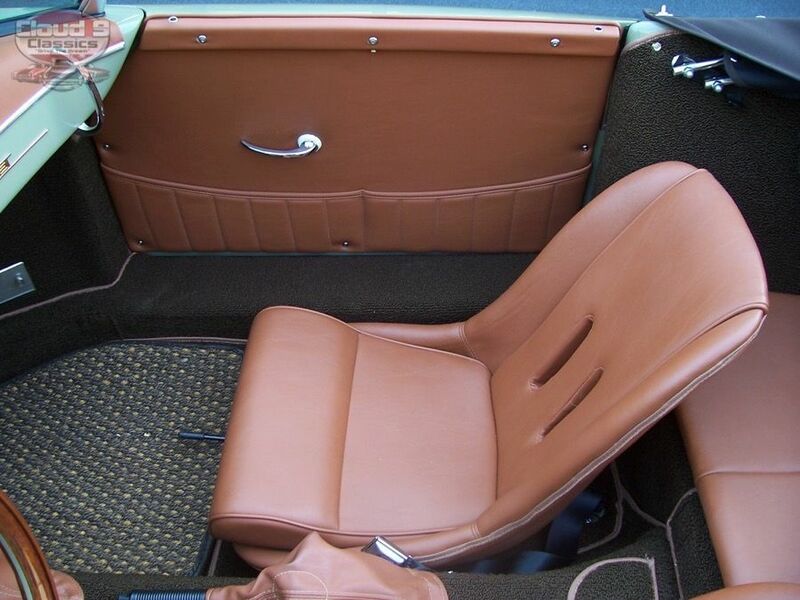 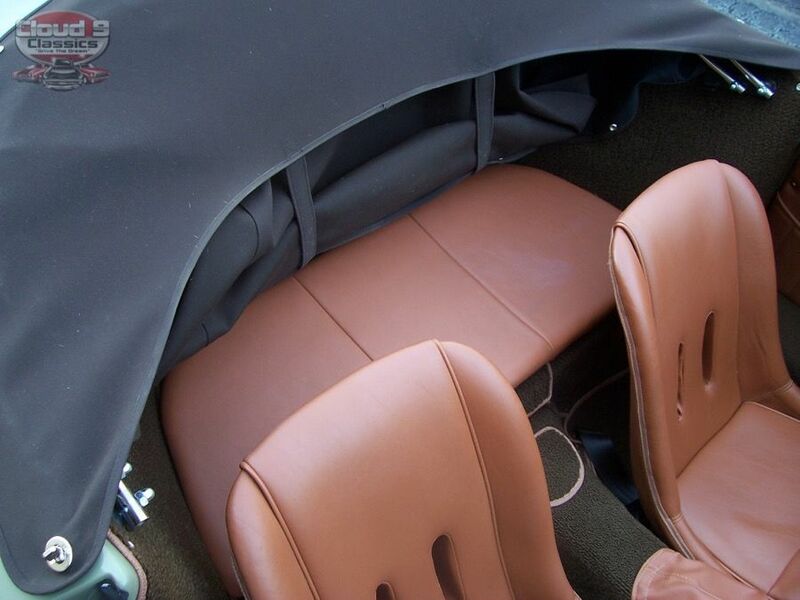 Rear seating area is padded to match and lets face it is really more of a storage area then a seat. 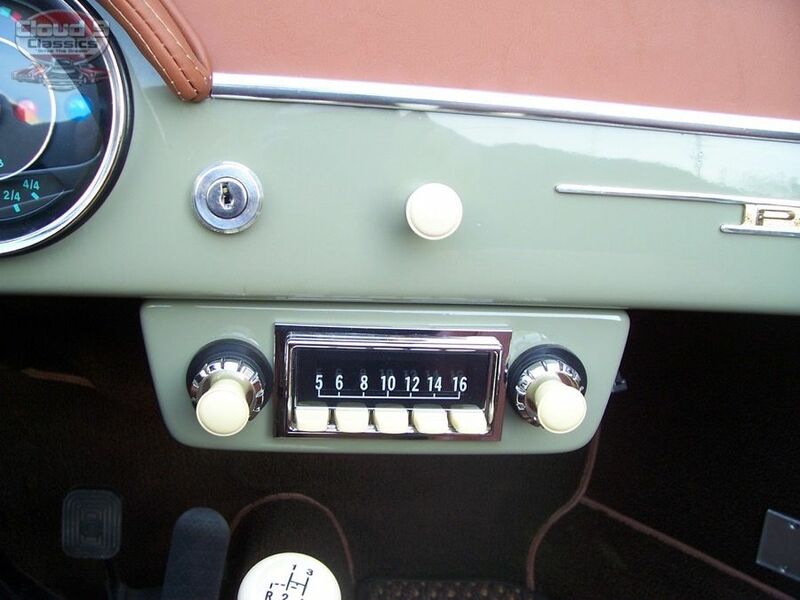 If needed this Speedster also has heat for those cool fall drives through the mountains .A great vintage look modern stereo is mounted under the dash with bluetooth and adapters for ipod/phone. 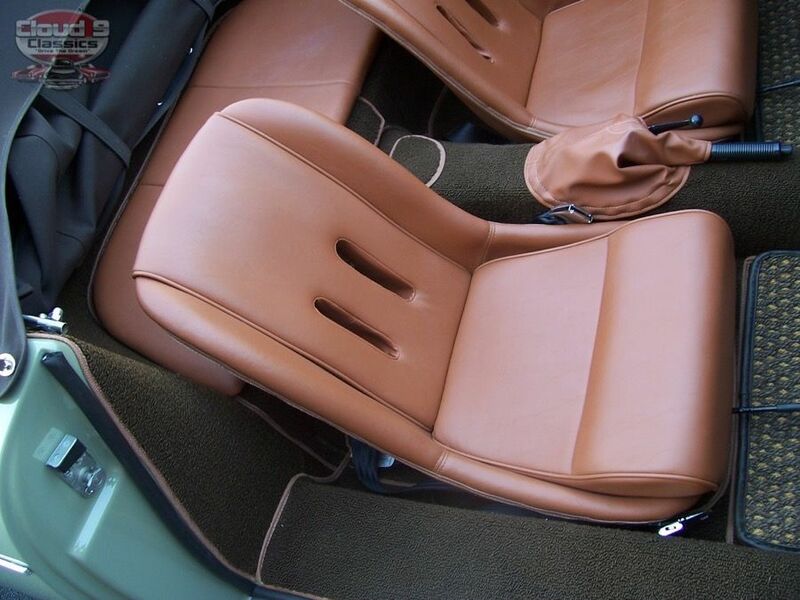 Carpeting is in the dark chocolate brown color and a great set of cocoa mats finish out the interior nicely. 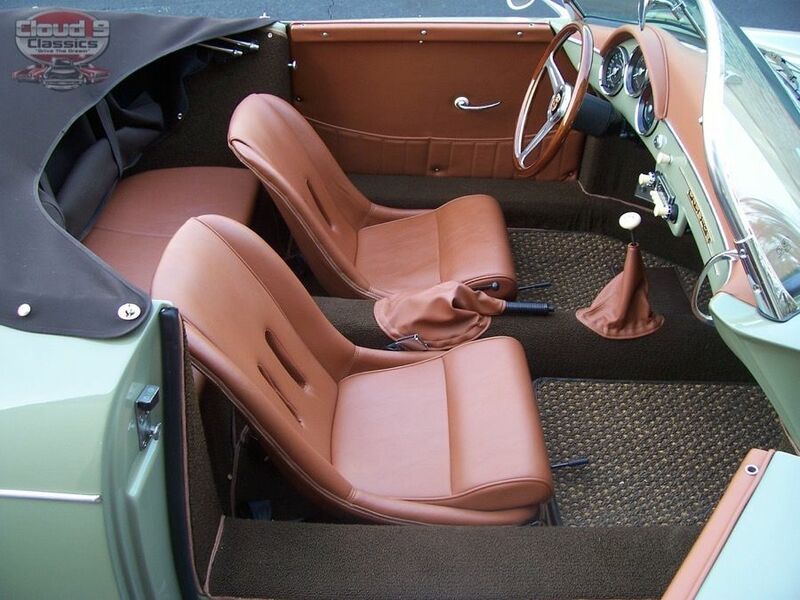 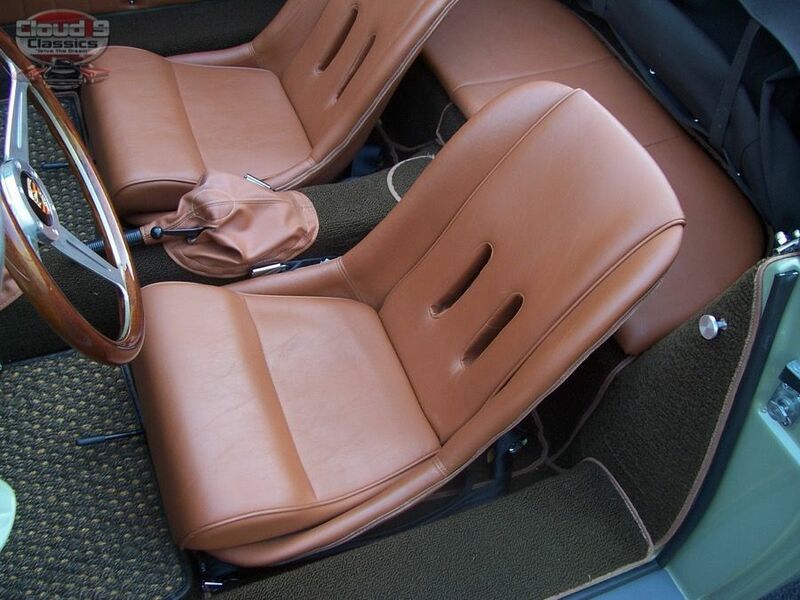 Just a beautifully designed interior that looks just like the real deal and in close to new condition. 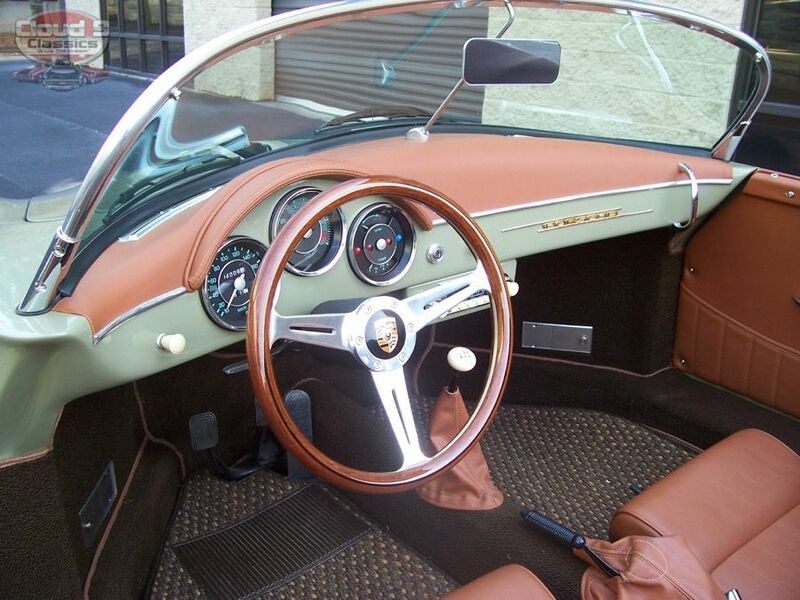 I have owned quite a few of these Vintage Speedsters so I knew what to expect when this one arrived. 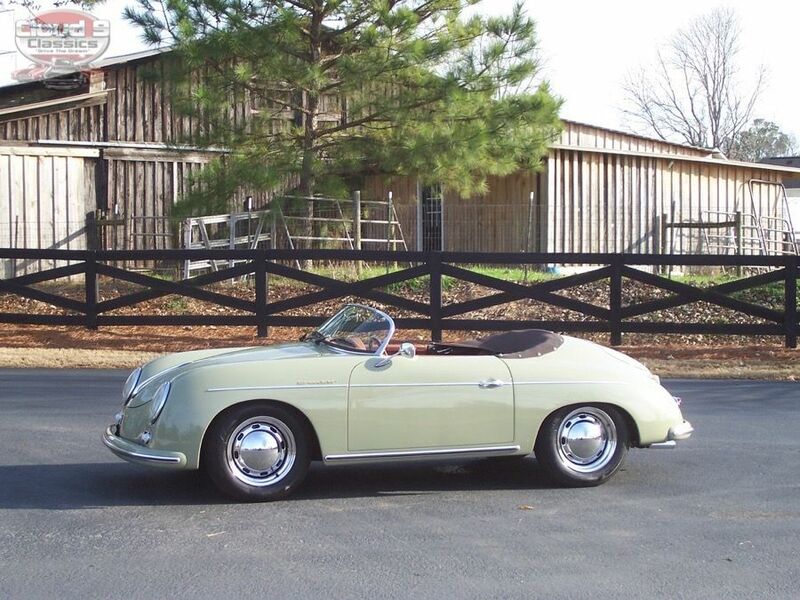 However, when I got my first one I have to admit I was a little skeptical about how much fun it would be to drive. 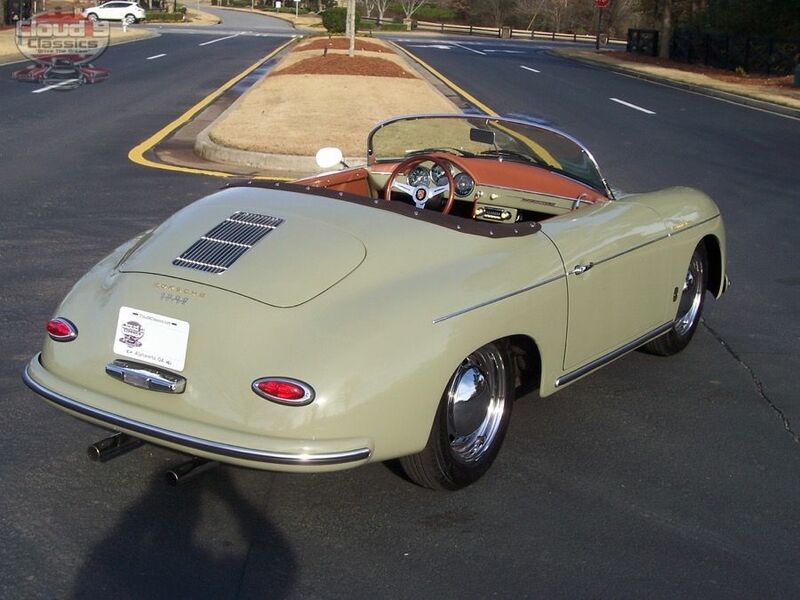 Well, after driving the first one we owned I was immediately a fan…after enjoying this beautiful stone gray Speedster on a nice ride today I am still a huge fan!!! I have driven plenty of high horsepower muscle cars, newer Corvettes, BMW’s and Porsches but these little Speedsters have truly won me over!! 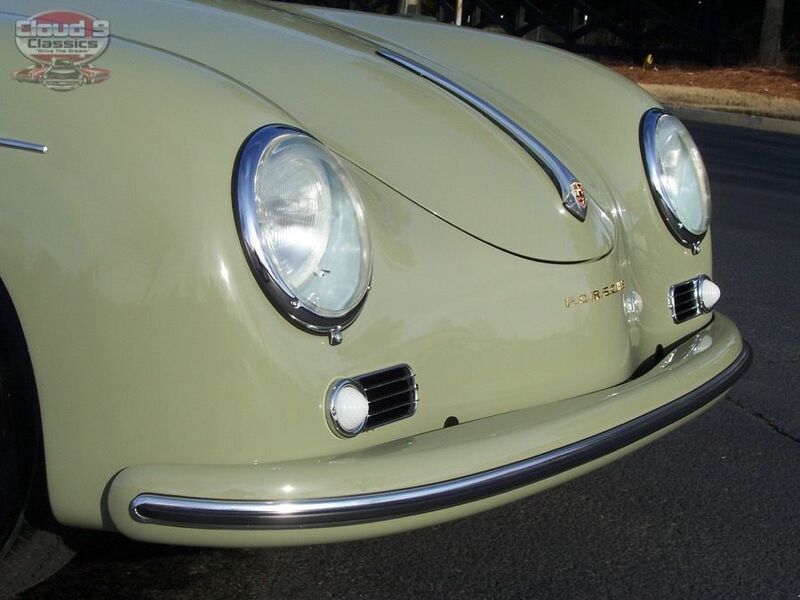 It has a serious fun factor to it unlike anything else. 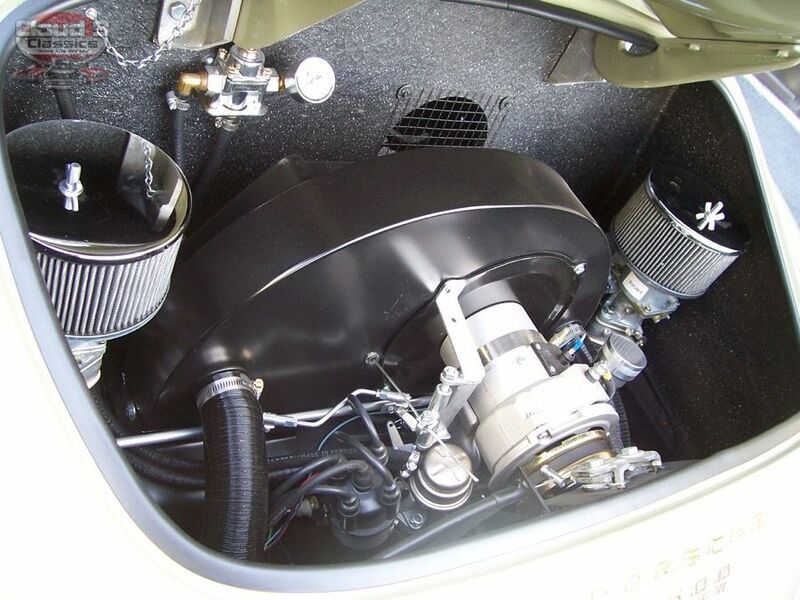 The dual carbureted 1600 cc motor pulls super strong and will keep up in highway traffic no problem. 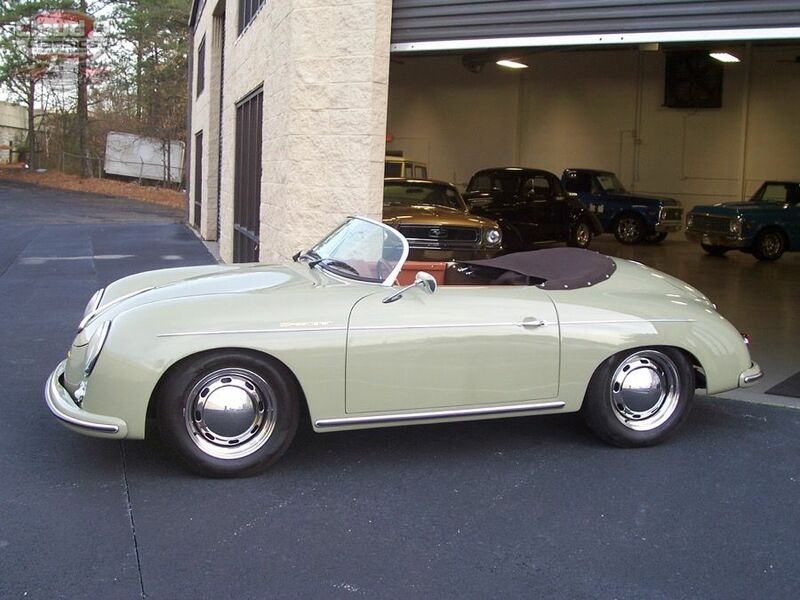 This particular speedster also has the upgraded 3:88 freeway flyer 4-speed transmission which shifts smoothly and takes this little roadster up to speed quickly with no problem and sounds great doing it! 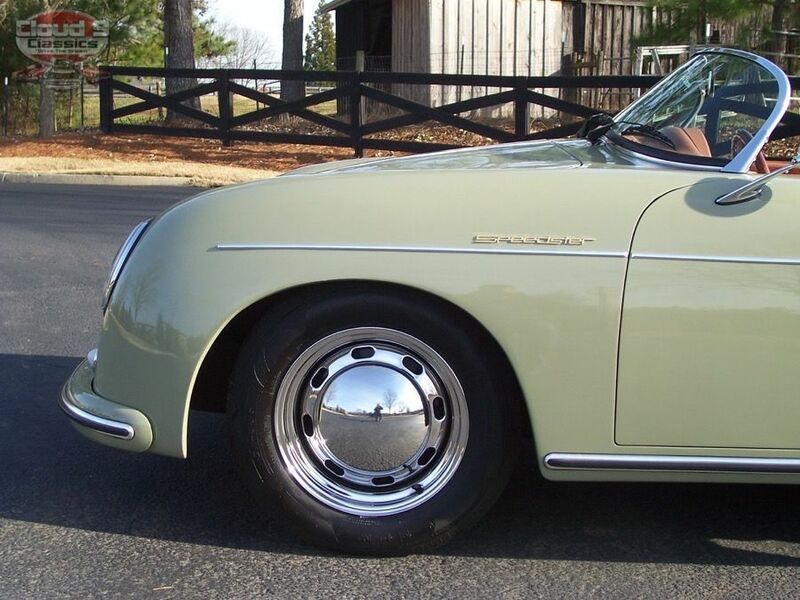 This one also has front disc brakes making stopping a breeze. 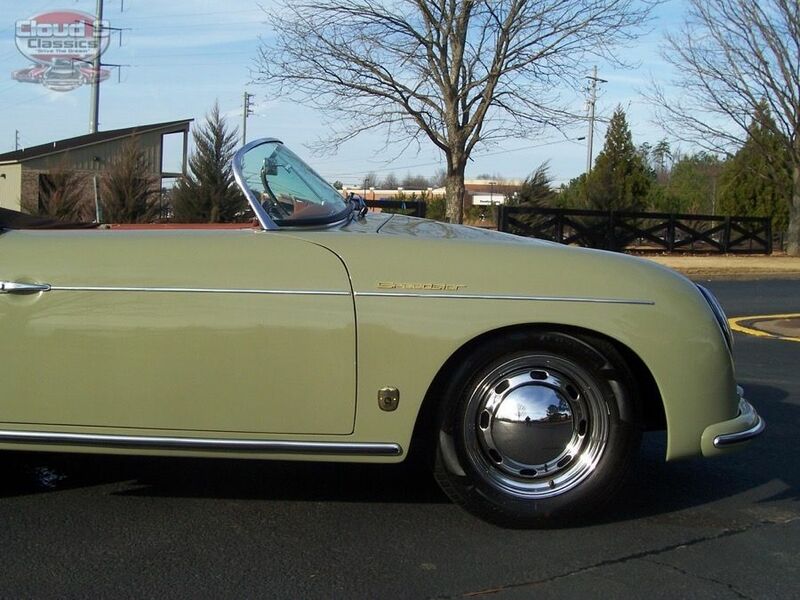 This little roadster really handles the road well and to me feels like a Porsche 911 on the road. 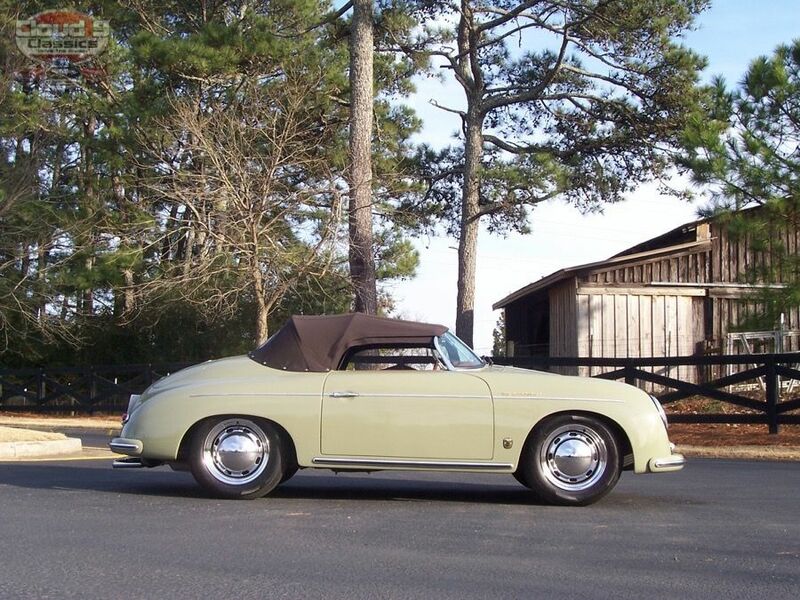 Maintenance is cheap and easy on this car and any foreign car mechanic should be able to do a valve adjustment and tune up every 3-4,000 Miles to keep it running great. 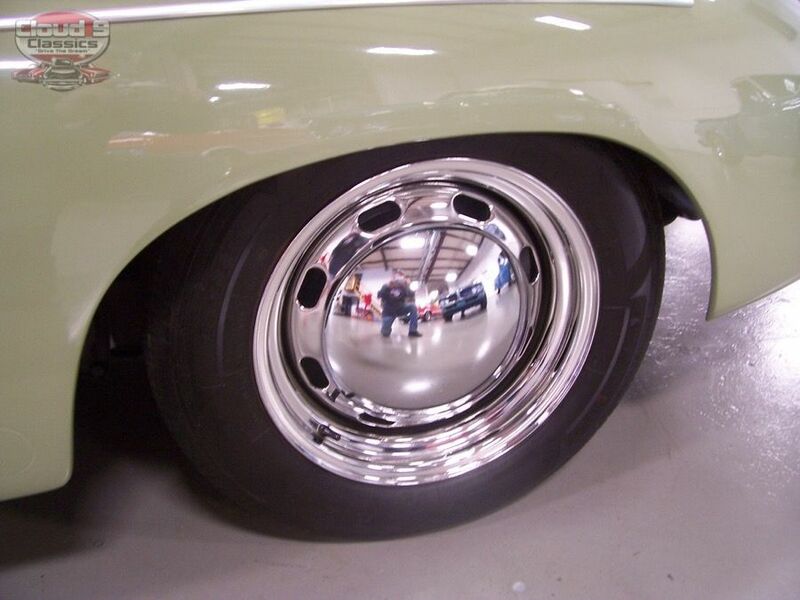 The radials are close to new and wheels and hub caps look great. 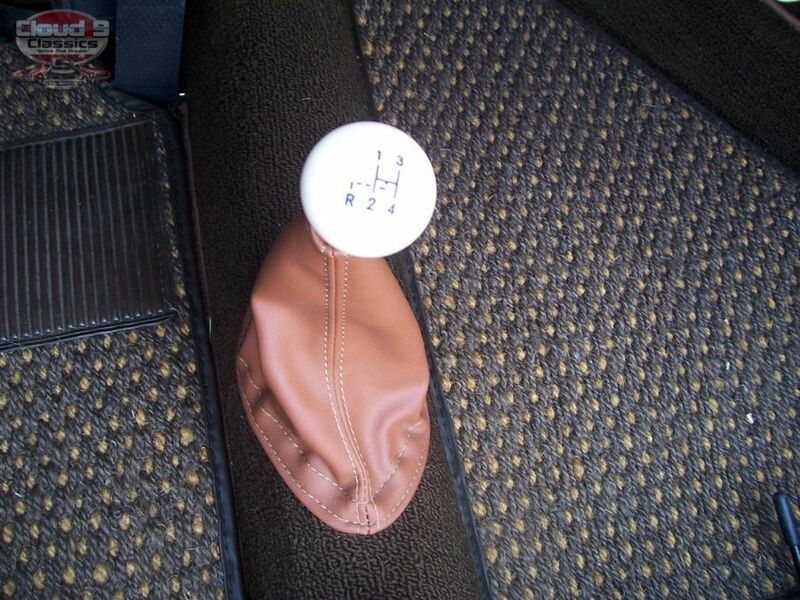 There is nothing this car needs but you in the drivers seat!!! 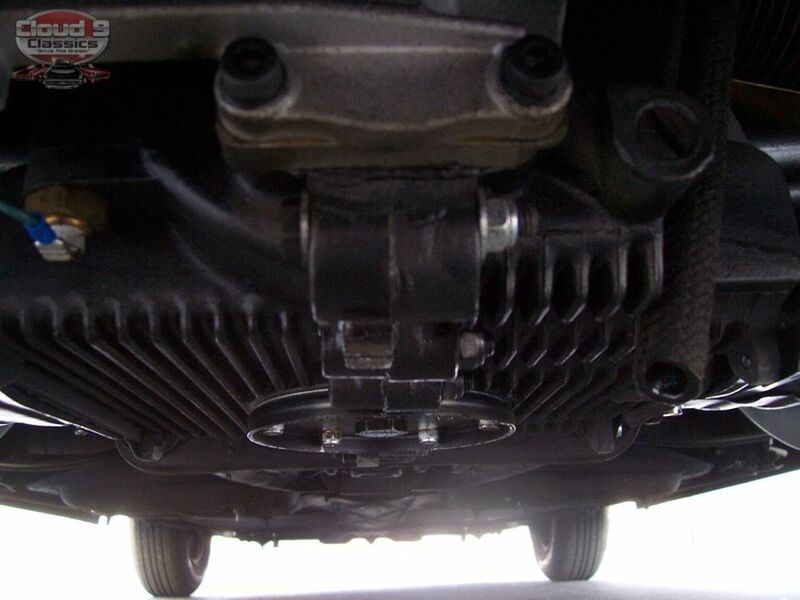 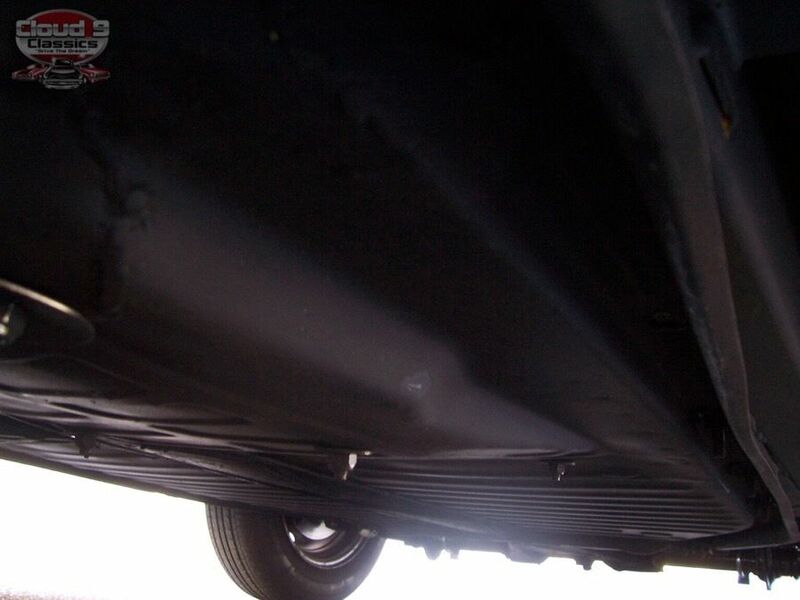 Undercarriage looks great! 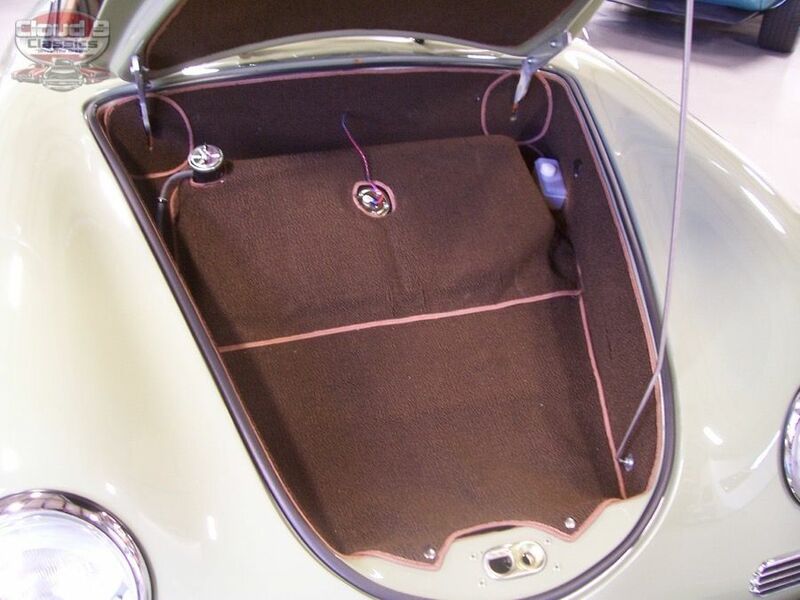 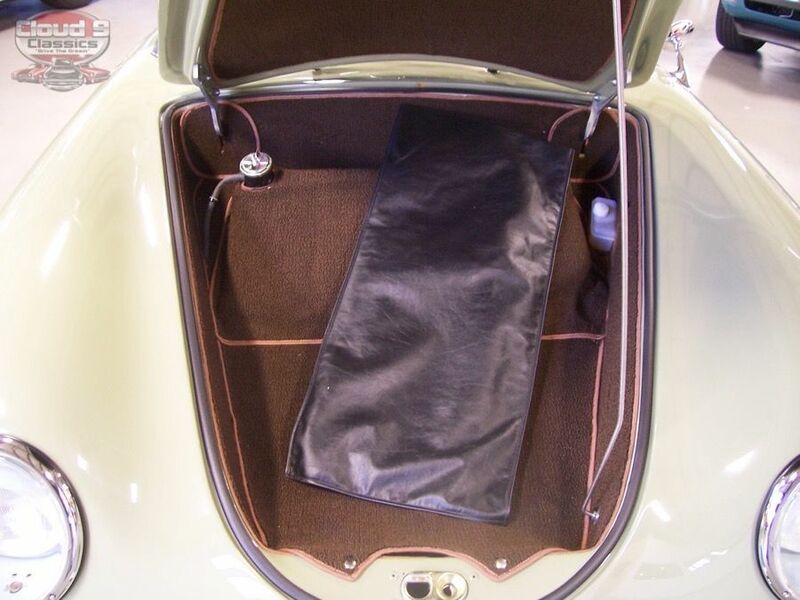 Plenty of storage in the front trunk area so go ahead and take that weekend trip to the mountains or the beach…this will be the ride of your life. 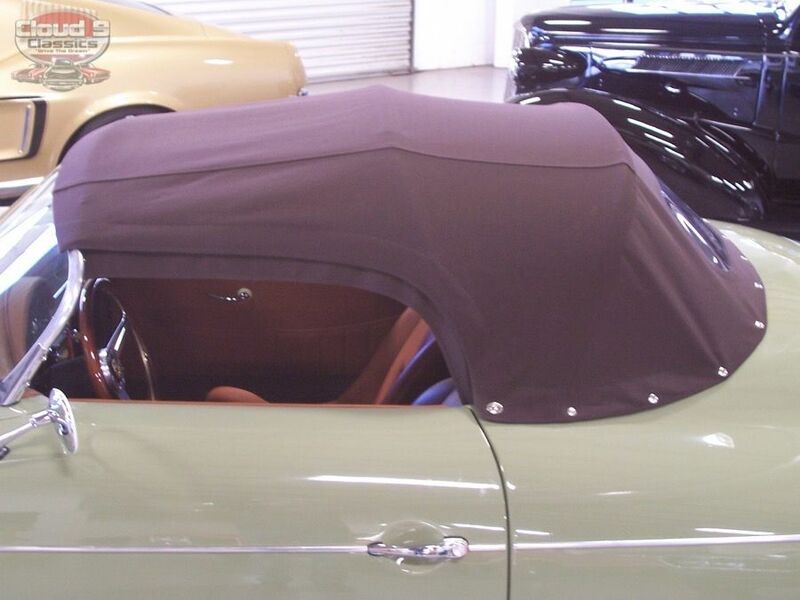 Make sure you leave a little extra time for all the questions and conversations you will have with folks who stop you. 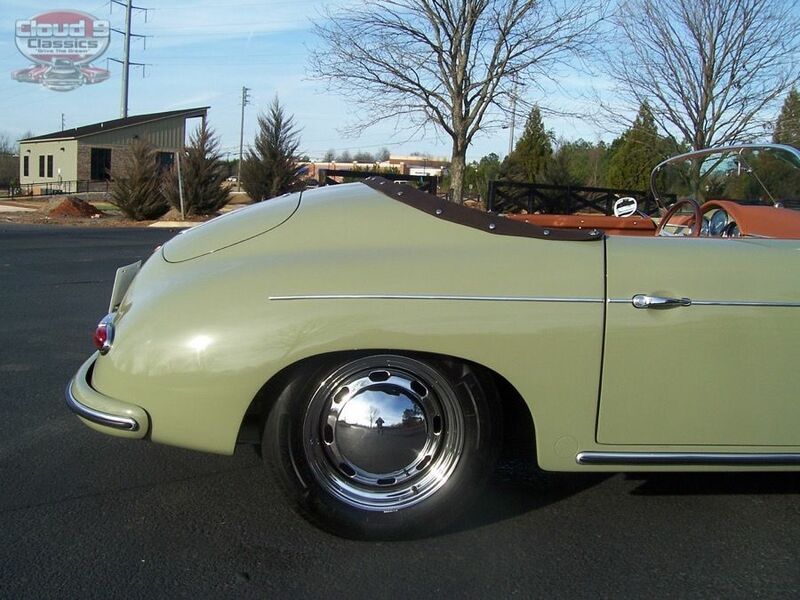 This Speedster Replica is titled as a 1966 Volkswagen making insurance and registration cheap and easy. 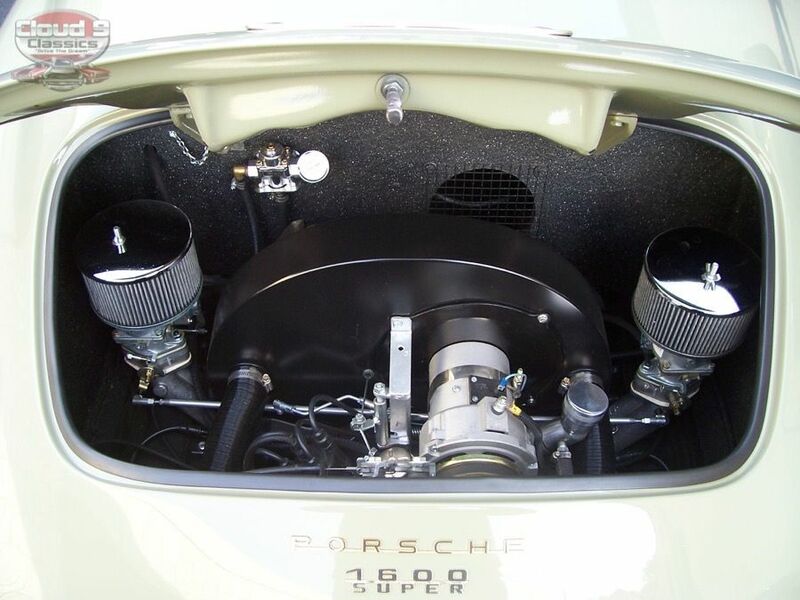 Check it out and also be sure to listen to the video that follows the pics below to hear this baby start up and running. 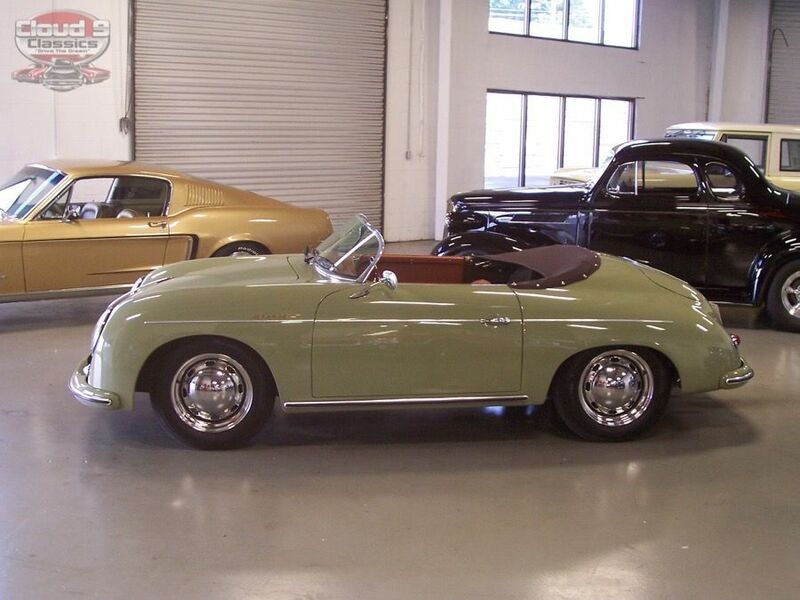 At this point hopefully you can see how showroom new this 356 Speedster Replica is and what a unique and beautiful color combination it is. 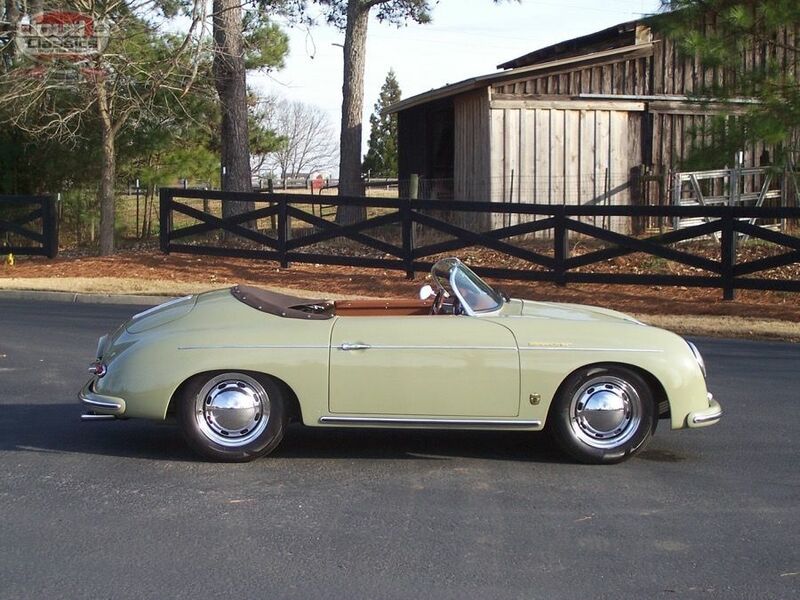 I am extremely confident that the next lucky owner will be smiling from ear to ear when it arrives. 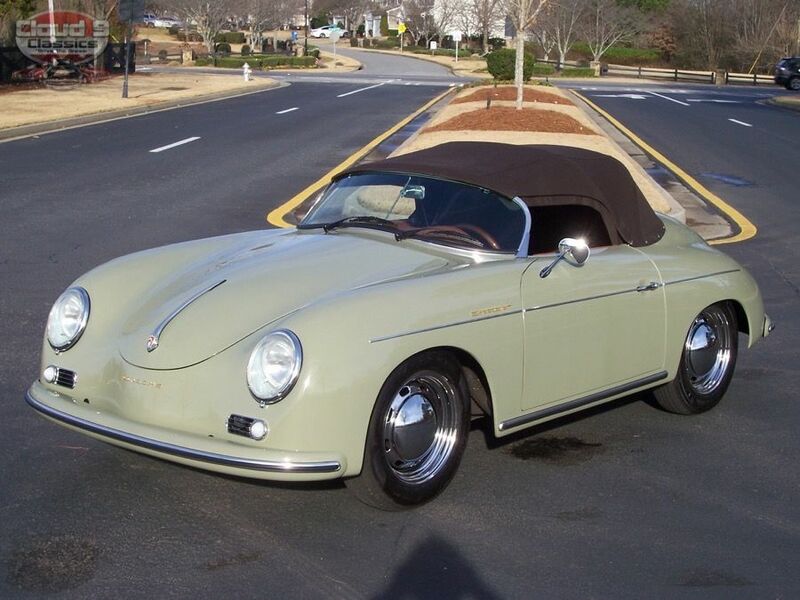 If you want to scoop this gorgeous roadster up before the next guy or gal does feel free to call me at 770-359-8400 to discuss how to make that happen.